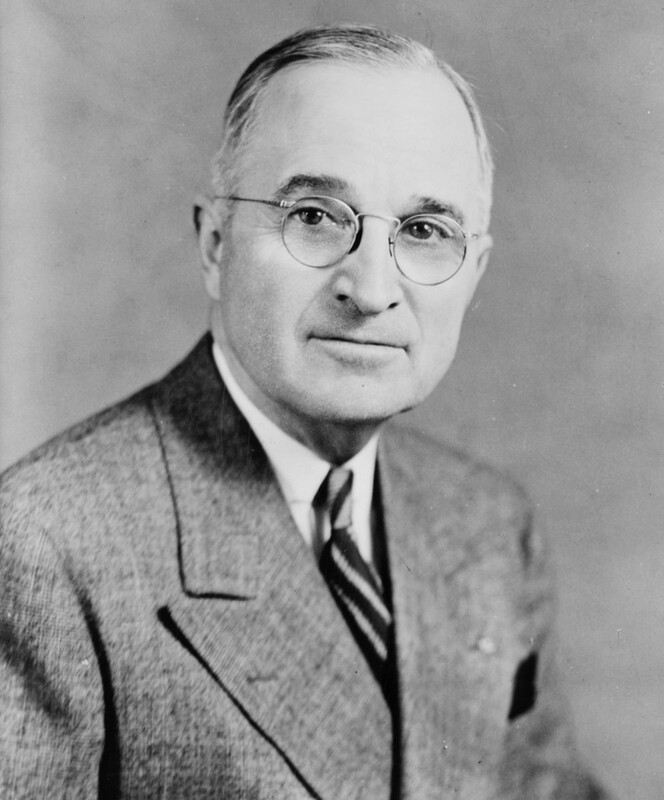 Harry S. Truman (May 8, 1884 - December 26, 1972) was an American politician who served as the 33rd President of the United States (1945-53), coming to office on the death of Franklin D. Roosevelt in the last months of World War II. He is known for launching the Marshall Plan to rebuild the economy of Western Europe, for leading the Cold War against Soviet communism through the Truman Doctrine and NATO, and for defending South Korea in the Korean War. In domestic affairs, he was a moderate Democrat whose liberal proposals were a continuation of Franklin Roosevelt's New Deal, but the Conservative-dominated Congress blocked most of them. He holds the record for vetoes at 180, and saw 12 overridden by Congress; Gerald Ford later tied that record. He used presidential authority to mandate equal treatment for blacks in the military and put civil rights on the national political agenda. 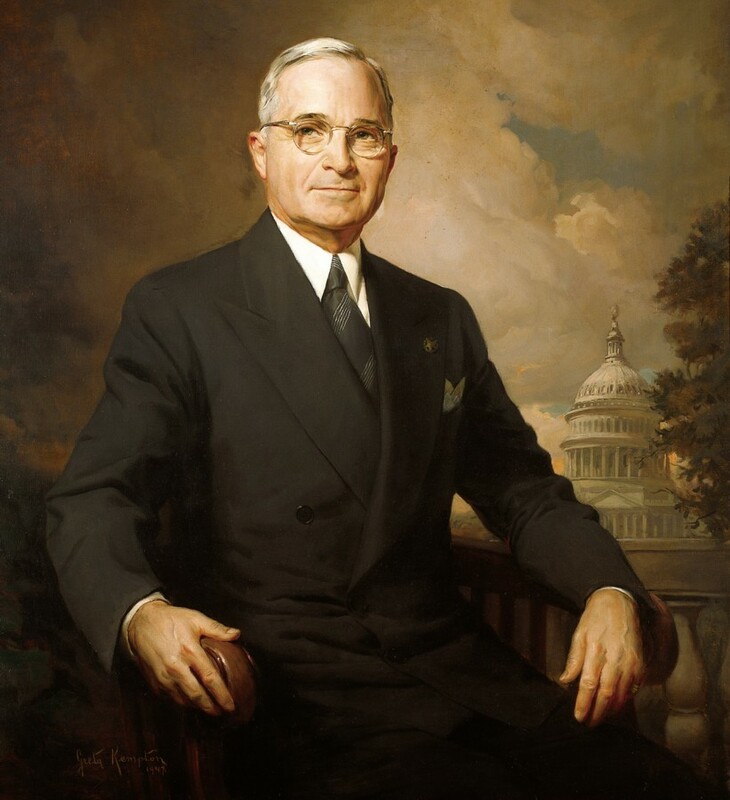 Truman served as a United States Senator from Missouri (1935-45) and briefly as Vice President (1945) before he succeeded to the presidency on April 12, 1945 upon the death of Franklin D. Roosevelt. He presided over an unexpected surge in economic prosperity as America sought readjustment after long years of depression and war. His political coalition was based on the white South, labor unions, farmers, ethnic groups, and traditional Democrats across the North. Truman was able to rally these groups of supporters during the 1948 presidential election and win election to a presidential term in his own right. Germany surrendered on Truman's birthday, just a few weeks after he assumed the presidency, but the war with Imperial Japan raged on and was expected to last at least another year. Truman approved the use of atomic bombs to end the fighting and to spare the hundreds of thousands of American and Japanese lives that would inevitably be lost in the planned invasion of Japan and Japanese held islands in the Pacific. 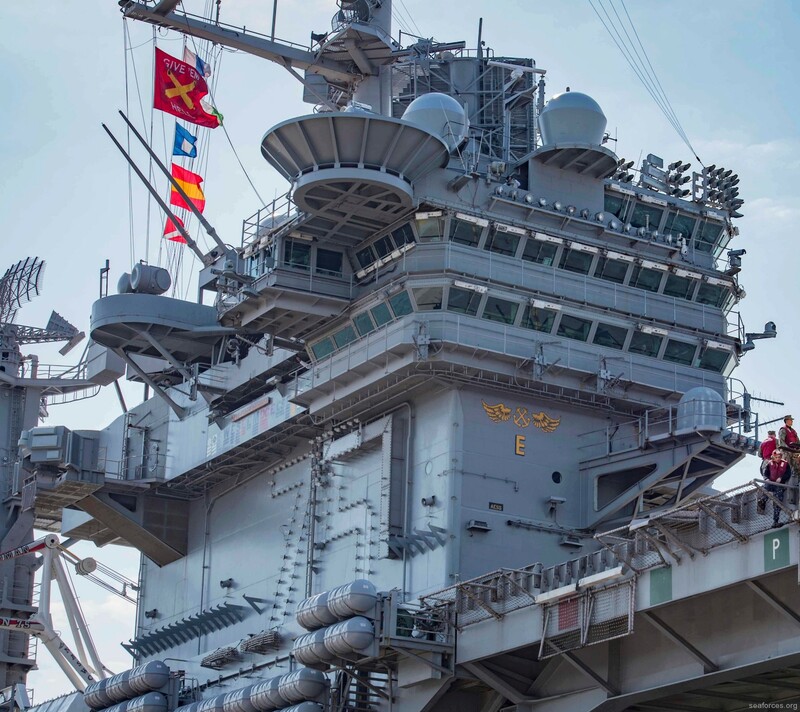 Although this decision and the numerous issues that arose as a result of it remain the subject of debate to this day, it was one of the principal factors that forced Japan's unconditional surrender. 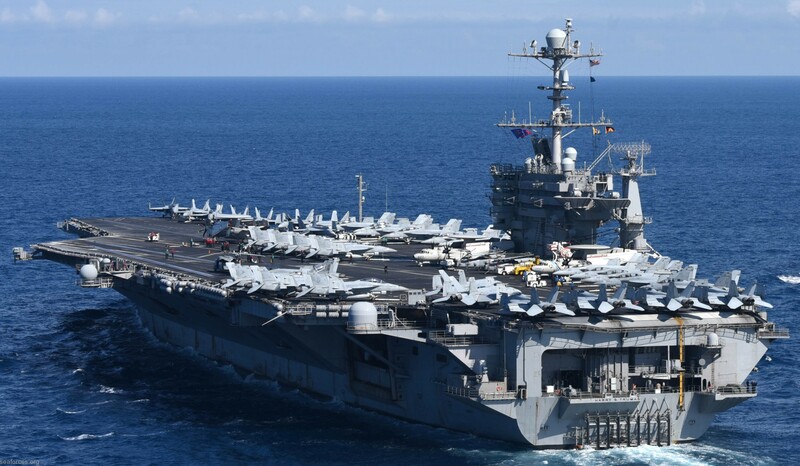 Truman's presidency was a turning point in foreign affairs, as the United States engaged in an internationalist foreign policy and renounced isolationism. Truman helped found the United Nations in 1945, issued the Truman Doctrine in 1947 to contain Communism, and got the $13 billion Marshall Plan enacted to rebuild Western Europe. The Soviet Union, a wartime ally, became a peacetime enemy in the Cold War. Truman oversaw the Berlin Airlift of 1948 and the creation of NATO in 1949. He was unable to stop Communists from taking over China. When communist North Korea invaded South Korea in 1950, he sent U.S. troops and gained UN approval for the Korean War. 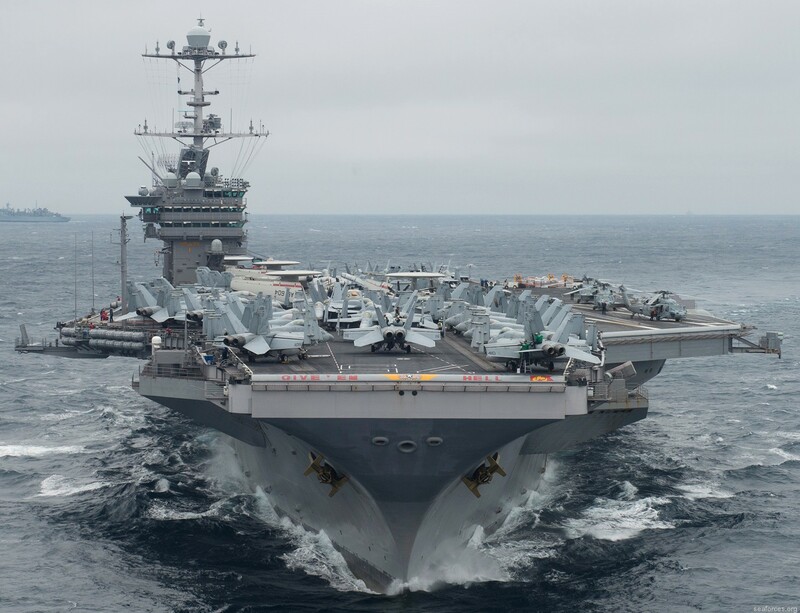 After initial successes in Korea, however, the UN forces were blocked by Chinese intervention, and the conflict was stalemated throughout the final years of Truman's presidency. 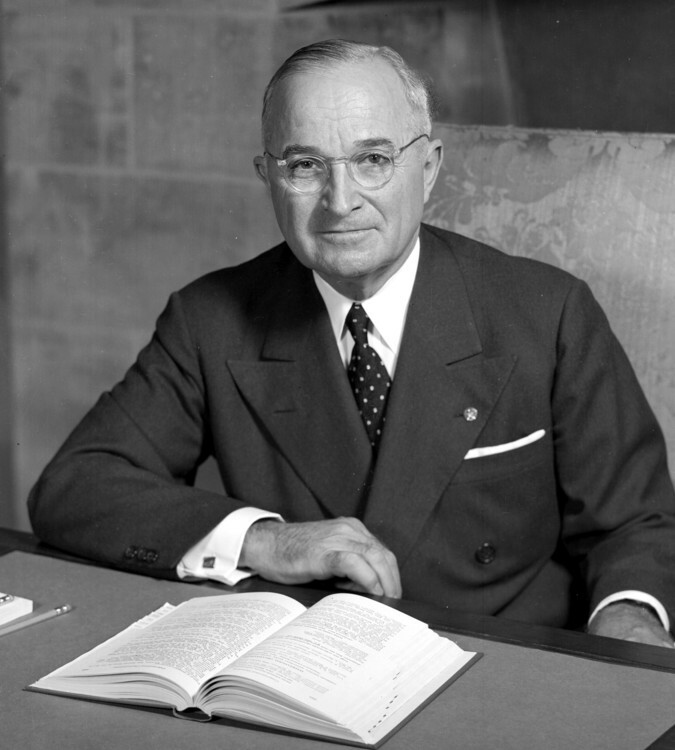 On domestic issues, bills endorsed by Truman often faced opposition from a conservative Congress dominated by the Southern legislators, but his administration was able to successfully guide the American economy through the post-war economic challenges. 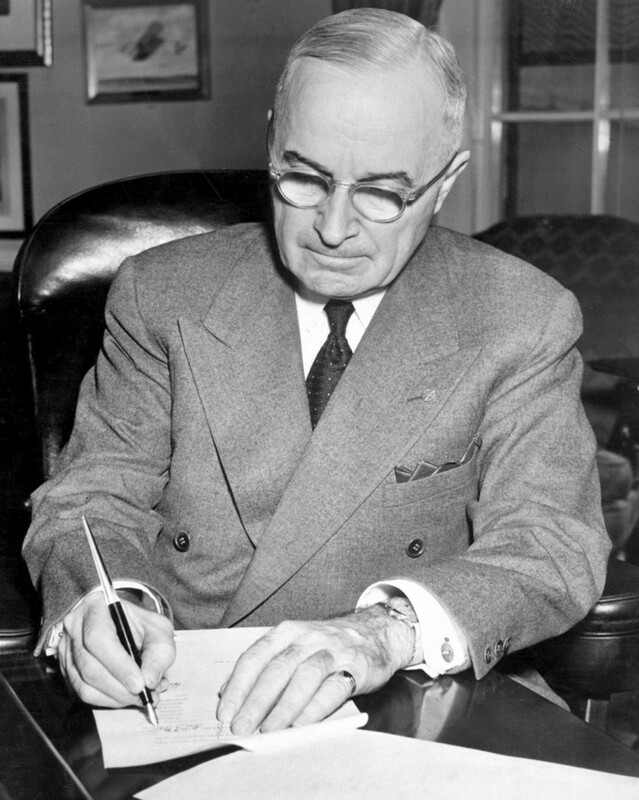 Truman maintained that civil rights were a moral priority, and in 1948 submitted the first comprehensive civil rights legislation and issued Executive Orders to start racial integration in the military and federal agencies. Allegations were raised of corruption in the Truman administration, linked to certain cabinet members and senior White House staff; this became a central campaign issue in the 1952 presidential election, and helped account for Republican Dwight D. Eisenhower's electoral victory. Scholars, starting in 1962, ranked Truman's presidency as "near great"; since then he has ranked from 5th to 9th place from the top. All this was preliminary to taking the train down to Grandview, Mo., a few miles south of the metropolis, walking a mile into the country from the station and presenting himself to Uncle Harrison Young, for whom he had been named, and to the family matriarch, Grandmother Harriet Louisa Young, nearly ninety years old. The grandmother remembered the Civil War, when she had been a strong sympathizer with the Confederate States of America. She took one look at her grandson, clad in uniform. "Harry," she said, "this is the first time since 1863 that a blue uniform has been in this house. Don't bring it here again." Harry did what he was told but, then, he later admitted that he thoroughly enjoyed his two three-year enlistments in the national guard, including a summer camp when everything was covered with a foot of water and he and his friends dug holes and enticed sergeants and lieutenants into them. Being an artilleryman, he told the inevitable story about a fellow guardsman who got his finger in the breech of a three-inch gun, lost it and ran for the camp hospital, and another friend picked up the finger and was taking it across the field when he stumbled and lost it. In 1917 although a farmer and over age - he was born in 1884 - he reenlisted and thought the men of the artillery regiment would make him a sergeant and instead they elected him first lieutenant. In France the next summer as a captain, he took over the unruly Battery D, which had been hard on its officers. The day after he took command his men knew they had (as one of them remembered) "a different cat to do business with." They liked him, then adored him, and he took them through heavy action and brought all 198 men and officers out alive. On the way back, in 1919, on the new 14,000-ton German steamer Zeppelin, loaded without ballast, which wallowed from one side to the other, the men whiled away their time playing poker, taking a percentage of each game to buy a 16-inch-high loving cup inscribed to "Captain Harry S. Truman. Presented by the members of Battery D in appreciation of his justice, ability and leadership." After three years (1919-22) as a haberdasher, Harry Truman went into politics, spending 10 years as an administrator of Jackson County, Mo., the big county containing both Independence and Kansas City, then 10 more as U.S. Senator. In January, 1945, he became Vice President under the ill Franklin D. Roosevelt and on Apr. 12 became President of the United States. He felt, he said, like the moon, ?he stars, and all the planets had fallen on him. In the work of the presidency from 1945 to 1953, Harry Truman made many judgments and made them in a manner that every citizen of the United States might well employ for serious decisions of any sort. To his detractors and even to some of his friends he had the reputation of making snap judgments and they were anything but that. When a problem arose apparently requiring a decision, after finding out whether it needed one he made what he called a "jump decision". This was a tentative, perhaps even instinctive, judgment. Then he thought it over, mulled it, plumbed its depths and widths, during his morning walks, in the interstices of the scheduled callers at his office, after afternoon naps (he worked each night, or attended formal functions, and a nap was a necessity), early in the mornings when arriving at his office at 6:00 a.m. or shortly after. Then, when he could wait no longer, he came to his decision. Afterward he did not look back, for what good would that do? Gen. George C. Marshall found the new president a delight to deal with, quick and orderly, as opposed to another president with whom Marshall, himself a man of quick and orderly judgment, had many dealings. In addition to these attractive ways of decision making Truman possessed another quality essential to judgment. This was something Marshall also possessed, that is, a remarkable selflessness. When people came to see him during his presidency he never believed for a moment that they came to see him, Harry Truman, but that they were paying their respects to the high office he held. The writer John Hersey observed him carefully for several days late in 1950, in preparation for a profile in the New Yorker and noticed that there were two people, Harry Truman the man and Harry Truman the president, and no confusion existed between the two roles. Years later I met the former president, who came up to me, put out his hand and said, simply, "Truman." For domestic affairs during the Truman administration the president sought a continuation of the New Deal and titled his own program the Fair Deal. Almost all of his proposals would be adopted, albeit years later. After World War II the principal concerns of his fellow citizens were demobilization of the country's huge military forces and reconversion of industry from wartime to peacetime production. The only proposal of domestic legislation by Harry Truman that did not get attention during the next two generations was his attempt to make medical care available for everyone. He was alarmed by the rising cost of care. What was the country coming to, he wrote a correspondent, when a working man could pay as much as $25 a day for a hospital bed? 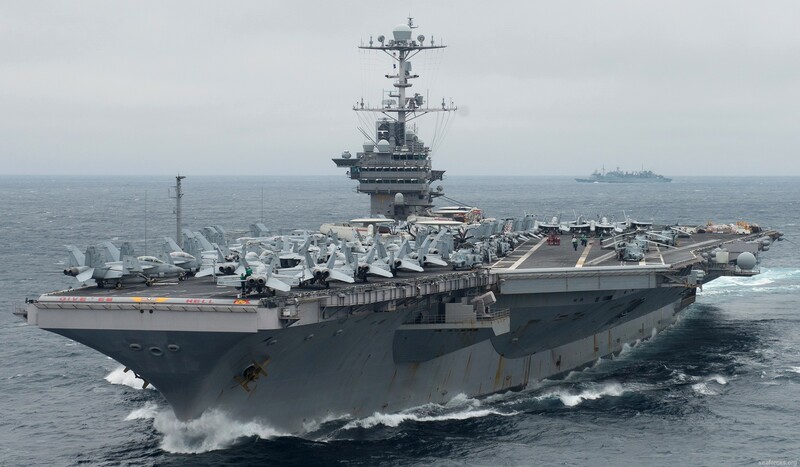 In foreign affairs his achievement was a series of great measures against the new postwar colossus, the Soviet Union: the Truman Doctrine (1947), Marshall Plan (1947), Berlin airlift (1948-49), North Atlantic Treaty (1949). The Cold War turned hot with the Korean War (1950-53). 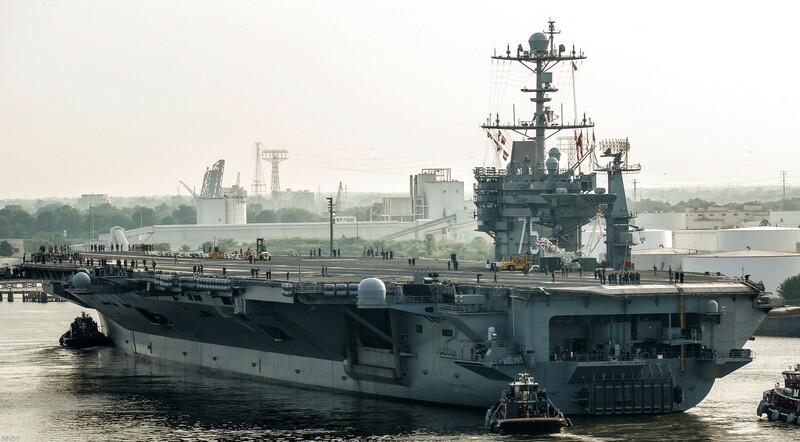 After the initial public enthusiasm for U.S. intervention in Korea, Truman was vilified for it. Harry Truman will go down in history as the first - and one must hope, only - President to approve the use of nuclear weapons. 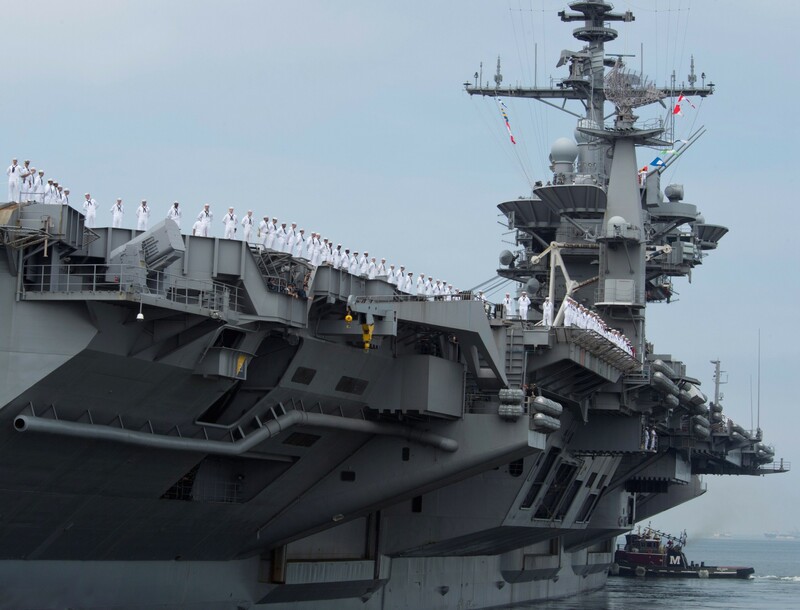 It was not so much a decision as a confirmation of a long series of smaller decisions that had taken the war in the Pacific against Imperial Japan to such a point that the Japanese government lay in the hands of its military commanders who were determined to fight to the finish. 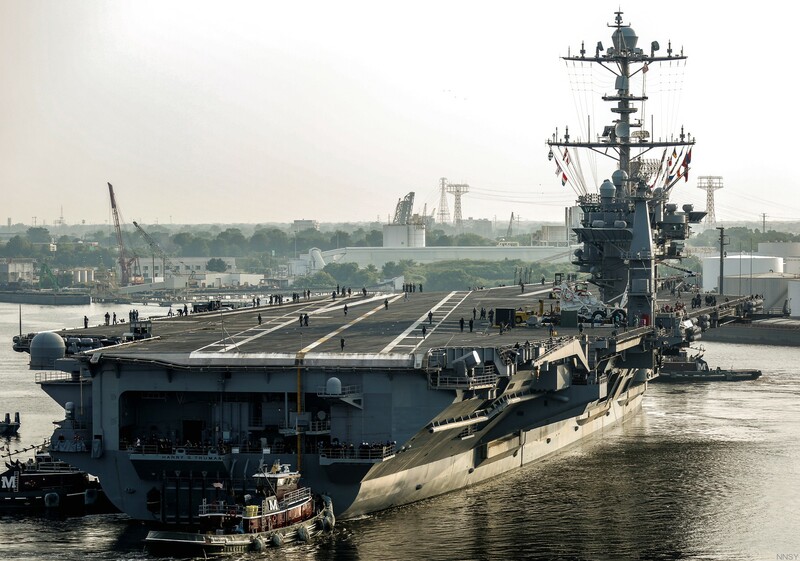 And with the decision to end the war by whatever weapons his own country had at hand, Truman soon faced other decisions involving the new nuclear weapons, decisions that transformed much of the basis of war, should it come once again. 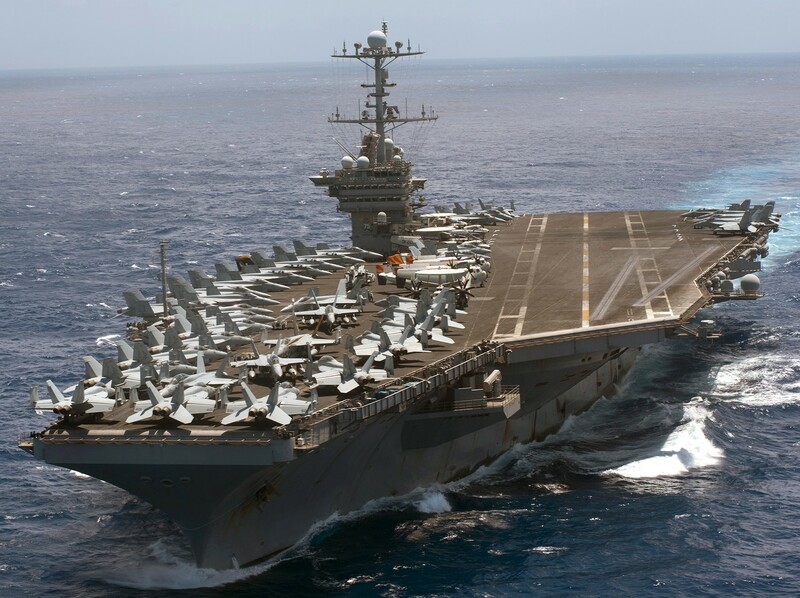 He was not merely the first president to order use of nuclear weapons but to confront the dual strategy the world's major nations have followed since, preparation for b?th nuclear and non-nuclear war. During his presidency the Soviet threat was very real. To his distress he beheld the slow production of nuclear bombs that began an era of "nuclear plenty" about the time of the Korean War. 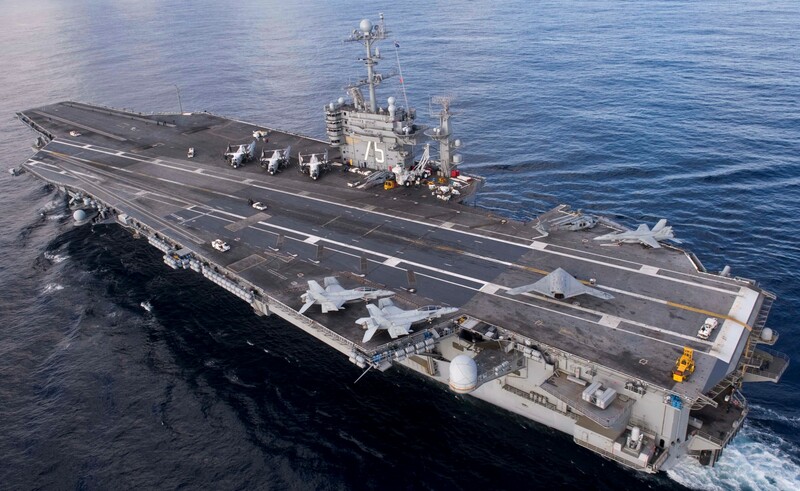 The U.S. Air Force became fully able to deliver nuclear weapons only about the same time. The threat from spies was large, for the Soviets obtained the design for the Nagasaki bomb shortly after it was used and employed it in their first nuclear device in 1949. 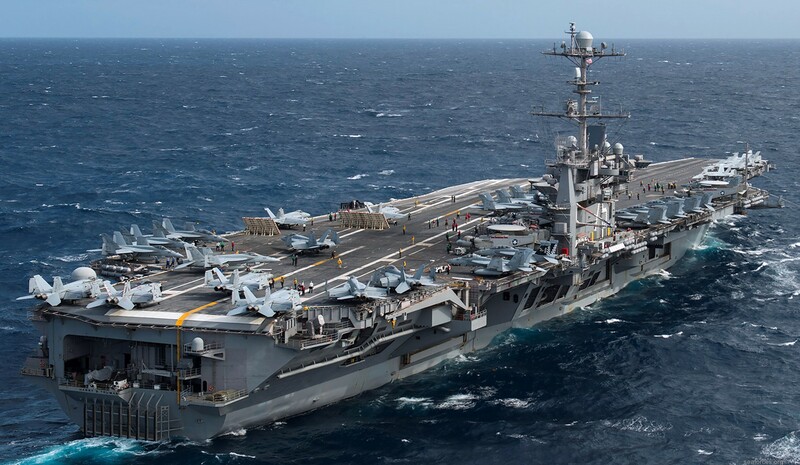 But as intricate as was what Winston Churchill described as the "balance of terror," even more so was the balance of conventional forces, keeping a balance between U.S. Army, U.S. Navy, and (with independence from the Army in 1947) U.S. Air Force. 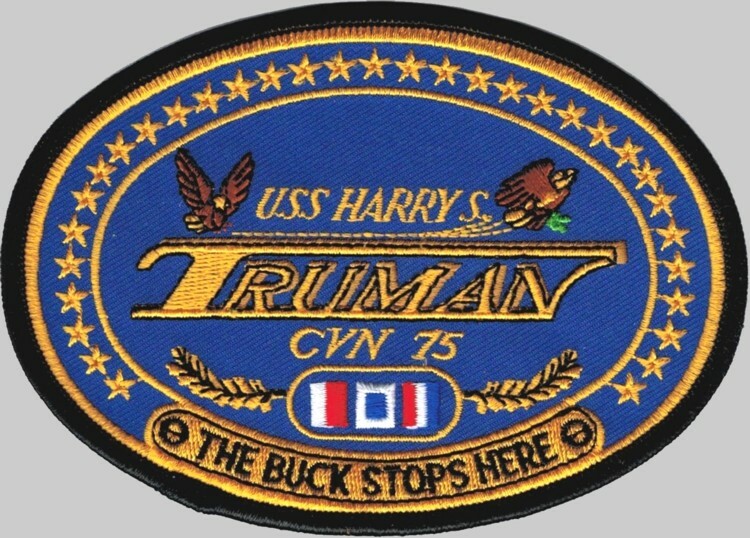 One of President Truman's closest military advisors was his naval aide beginning in 1947, Rear Adm. Robert L. Dennison, who had come to the president's attention that year as captain of USS MISSOURI (BB 63) during a voyage back from Rio de Janeiro where Truman and his advisors opened an inter-American conference. 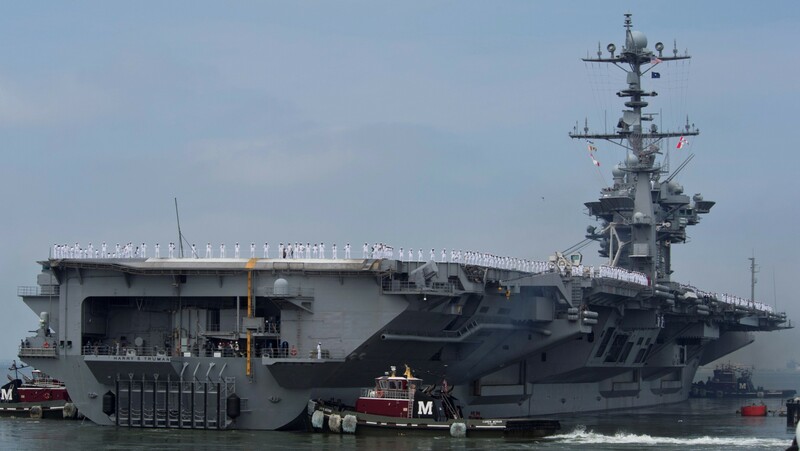 Dennison stayed on until the end of the administration and may well have been one of the most effective aides the Navy ever assigned a president of the United States. Modest and unassuming like the president he served, "Bob" Dennison worked at every task to the best of his ability, which said a great deal for quality and accomplishment. At the outset he sensed a wariness in his "boss," for Truman behind his good-natured Missouri personality was a formal, formidable person who did not give his trust easily. Dennison waited out his apprenticeship and the trust came. 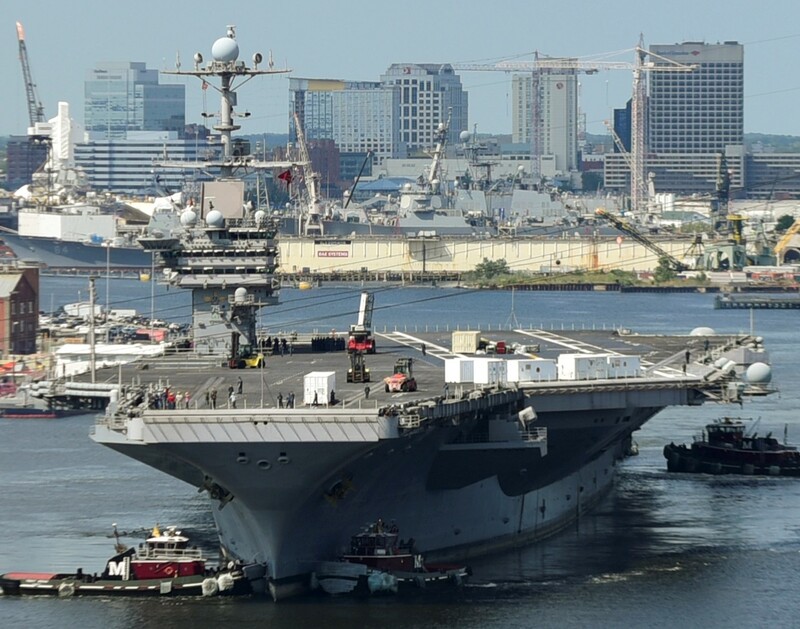 Dennison finished his illustrious career as commander-in-chief of the Atlantic Fleet. 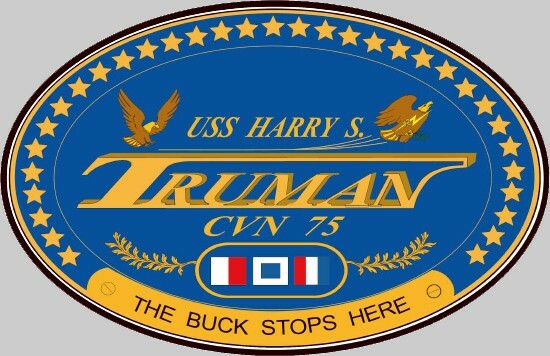 Harry S. Truman was authorized as CVN-75 on 30 June 1988; named United States on 9 May 1989; subsequently renamed Harry S. Truman; laid down on 29 November 1993, at Newport News Shipbuilding and Dry Dock Co., Newport News, Va.; launched on 7 September 1996; sponsored by Mrs. Barbara Bush, wife of President George H.W. 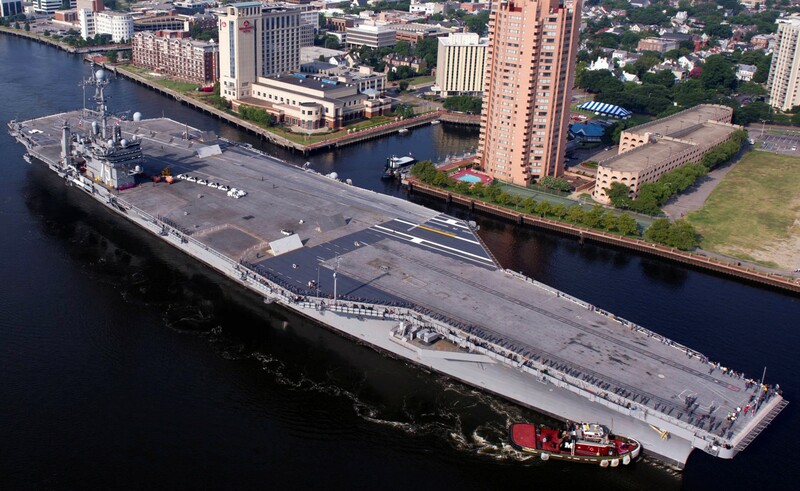 Bush; and commissioned on 25 July 1998 at Naval Station Norfolk, Va., Capt. 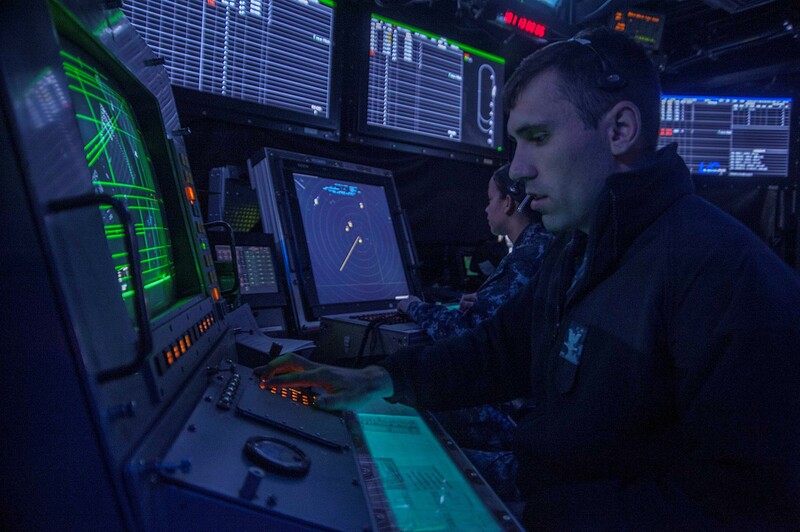 Thomas G. Otterbein in command. 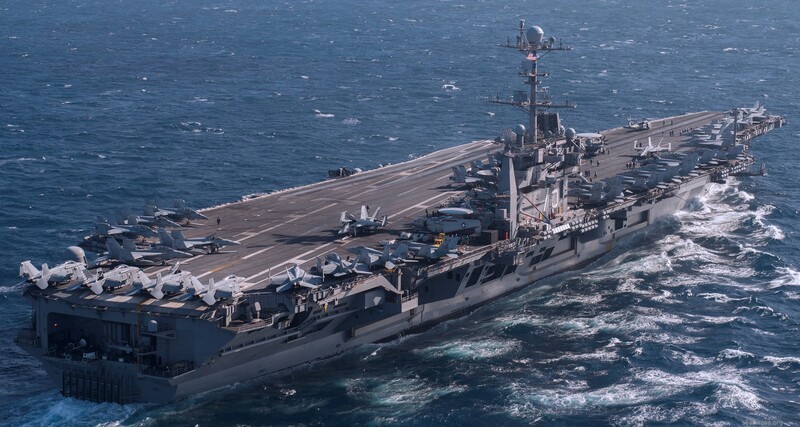 Boeing F/A-18E/F Super Hornets completed their second round of sea trials on board Harry S. Truman off the Virginia capes (3-14 March 1999). Capt. 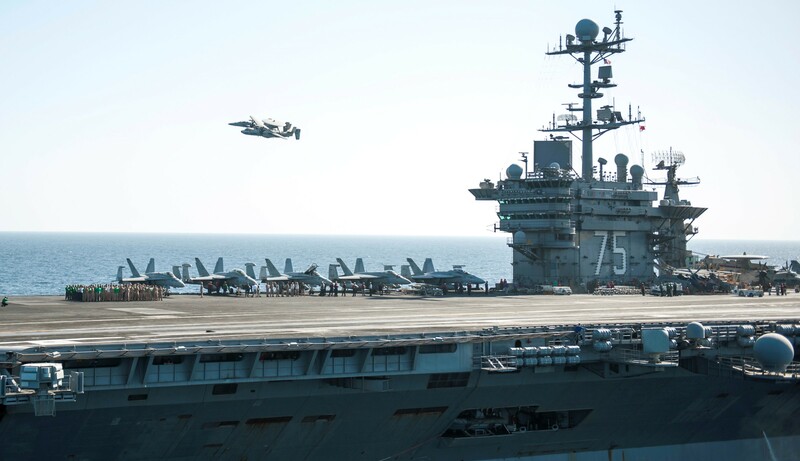 Robert O. Wirt Jr., Lieutenant Commanders Timothy H. Baker, Robert L. Floyd, and Michael M. Wallace, Maj. Matt Shihadeh, USMC, and Lieutenants Alan D. Armstrong, Erik O. Etz, and Klas W. Ohman flew F1 and F2 on 3 March. Aircraft flying from Harry S. Truman, Capt. 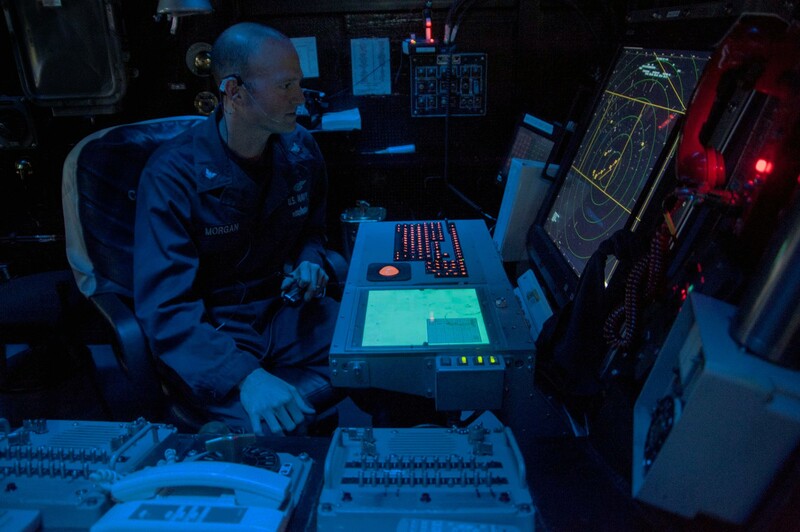 David L. Logsdon in command, and with CVW-3 embarked, during her maiden deployment to the Mediterranean, Red Sea, Gulf of Aden, Indian Ocean, Arabian Sea, and Arabian Gulf (28 November 2000-23 May 2001), struck an Iraqi radar system in southern Iraq with precision-guided munitions during Operation Southern Watch, on 1 January 2001. 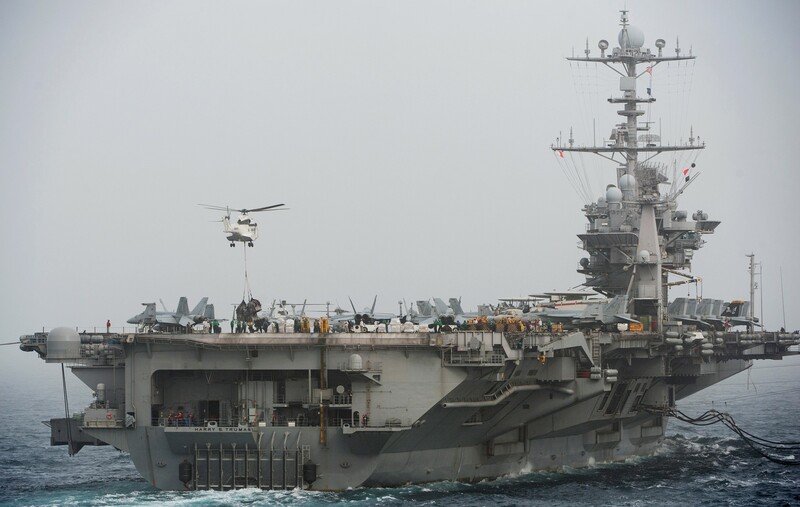 Harry S. Truman carried out a maritime interception operation surge in the Arabian Gulf, to enforce Iraqi compliance with UN sanctions, early the next month. 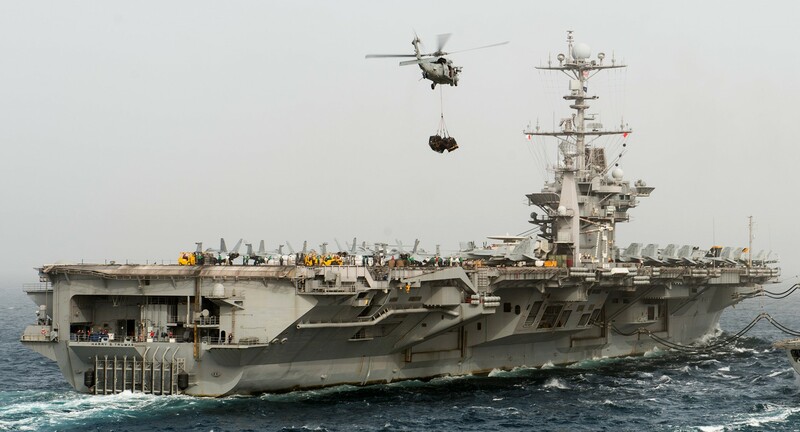 On 5 February, Aircraft 617, a Sikorsky SH-60F Seahawk from Helicopter Antisubmarine Squadron (HS) 7, operating from the ship proved instrumental in a coalition operation that halted the smuggling of 2,300 metric tons of Iraqi oil worth $460,000 by vessels Al Salam and Mustafa. The surge concluded on 11 February. Following Operation Desert Fox (16-20 December 1998), the Iraqis had launched more than 60 surface-to-air missiles and fired antiaircraft guns more than 1,000 times at aircraft. Early in 2001, coalition intelligence analysts revealed that Iraqi dictator Saddam Hussein had begun to install fiber optic cabling into his air defense network. Iraqi gunners learned to briefly radiate their radars to avoid retribution from Hussein’s henchmen, then shut down and run to escape allied AGM-88 High-speed Anti-Radiation Missiles, but then began to radiate radars from around Baghdad, outside the no-fly zones, sending targeting data to their guns through the cables. On 16 February therefore, 25 American and British aircraft attacked Iraqi military targets with the largest strikes since Desert Fox. 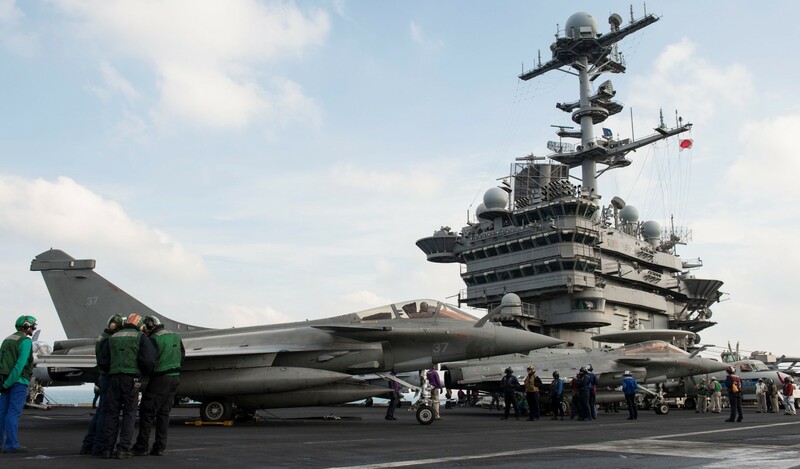 Harry S. Truman launched F/A-18C Hornets from Strike Fighter Squadrons (VFAs) 37 and 105 and Marine Strike Fighter Squadron (VMFA) 312, and Grumman EA-6B Prowlers from Electronic Warfare Squadron (VAQ) 130, and together with USAF McDonnell Douglas F-15E Strike Eagles and British Panavia GR.1 Tornados, the allied aircraft struck five Iraqi radar, and command, control, and communication nodes outside Baghdad with a variety of ordnance including AGM-154A Joint Standoff Weapons. 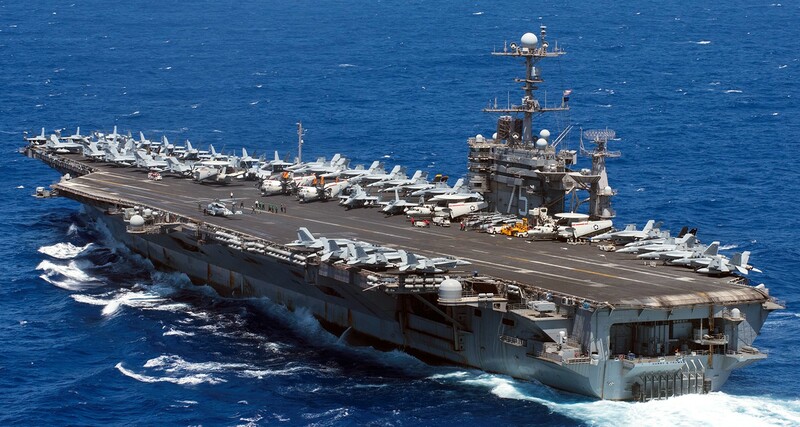 On 11 April 2003, the Navy designated the Eastern Mediterranean east of 30°E as a zone for eligibility for Imminent Danger Pay or Combat Zone Tax Relief benefits. 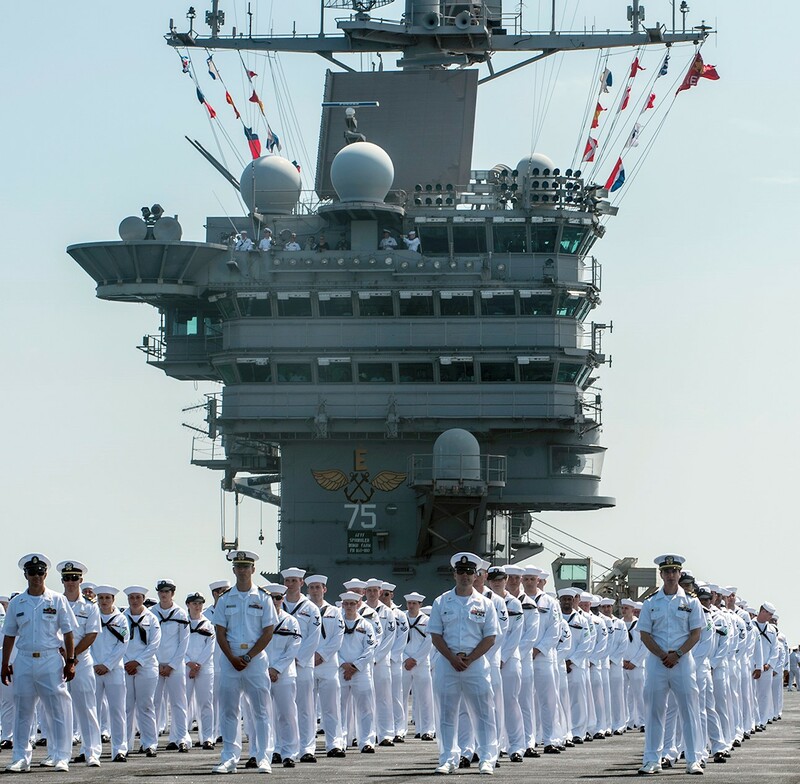 This move fell short of reaching all the veterans who served in Operation Iraqi Freedom I because it failed to identify those who took part from 19 March. 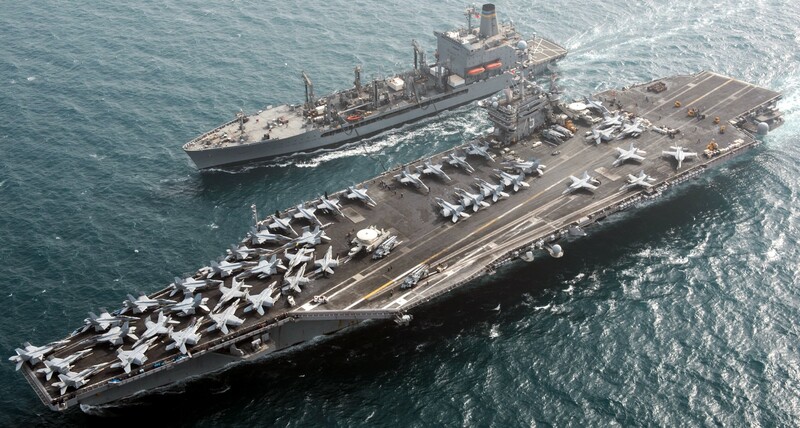 On 18 February 2004, Navy officials thus announced the retroactive eligibility of veterans of Iraqi Freedom for the benefits during that initial 24-day period. 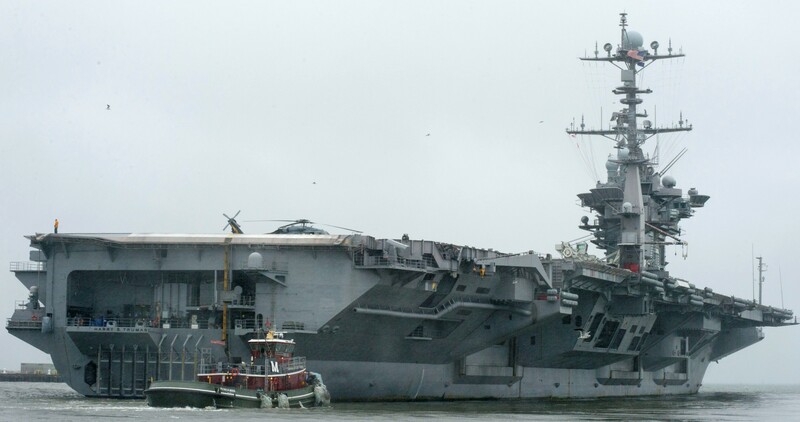 The decision principally impacted Task Force 61, including aircraft carriers Harry S. Truman, with CVW-3 embarked, and Theodore Roosevelt (CVN-71), with CVW-8 embarked. 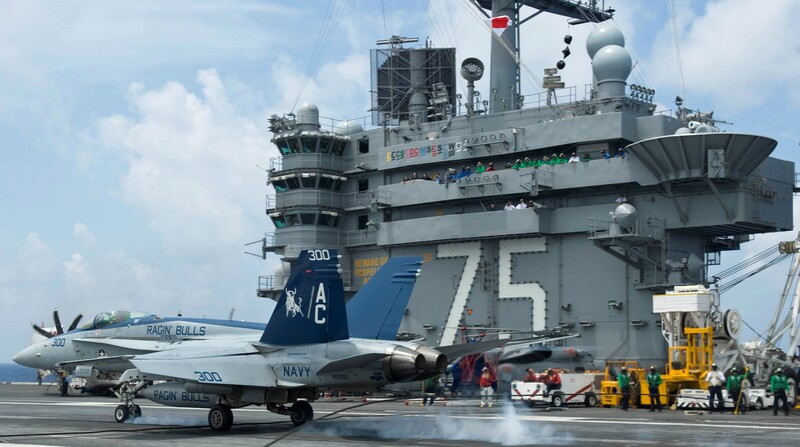 Training Squadron (VT) 9’s Lt. Charles B. Bassel, the squadron’s E-2/C-2 Standardization Officer, performed the last arrested landing of a North American T-2C Buckeye, during carrier qualifications on board Harry S. Truman on 17 July 2003. 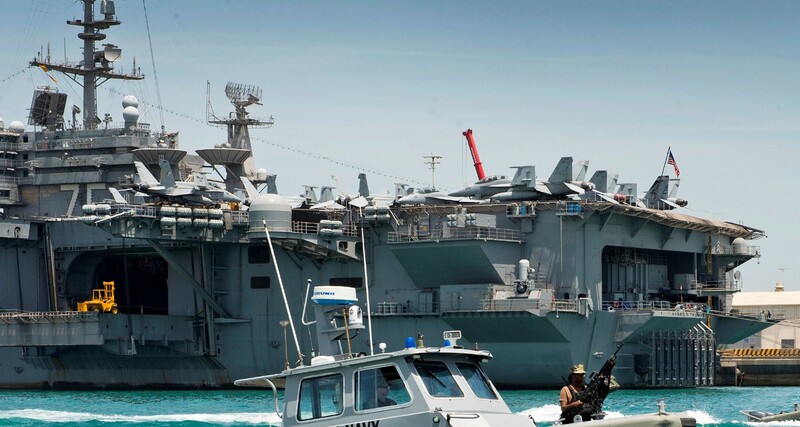 During Summer Pulse 04 the Navy tested changes to operational methods that resulted from the Fleet Response Plan. 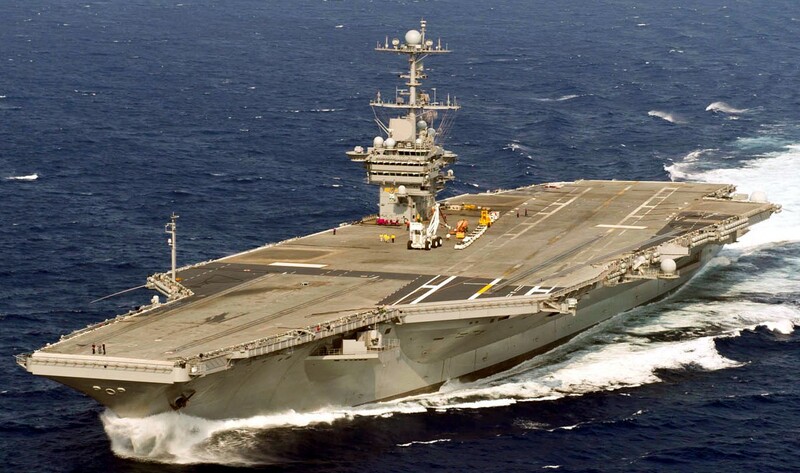 At times from June 2004, aircraft carriers Enterprise (CVN-65), George Washington (CVN-73), Harry S. Truman, John C. Stennis (CVN-74), John F. Kennedy (CV-67), Kitty Hawk (CV-63), and Ronald Reagan (CVN-76) deployed in five theaters. 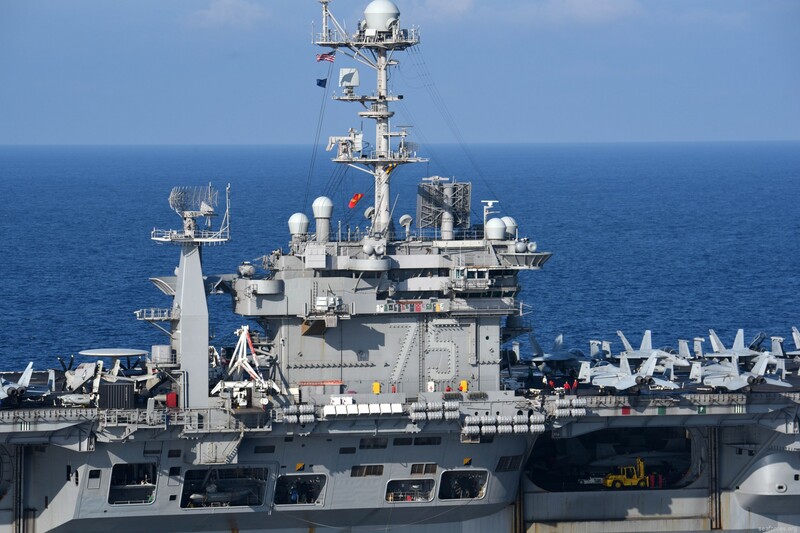 Their operations extended into September during scheduled deployments, surge operations, and joint and international exercises. 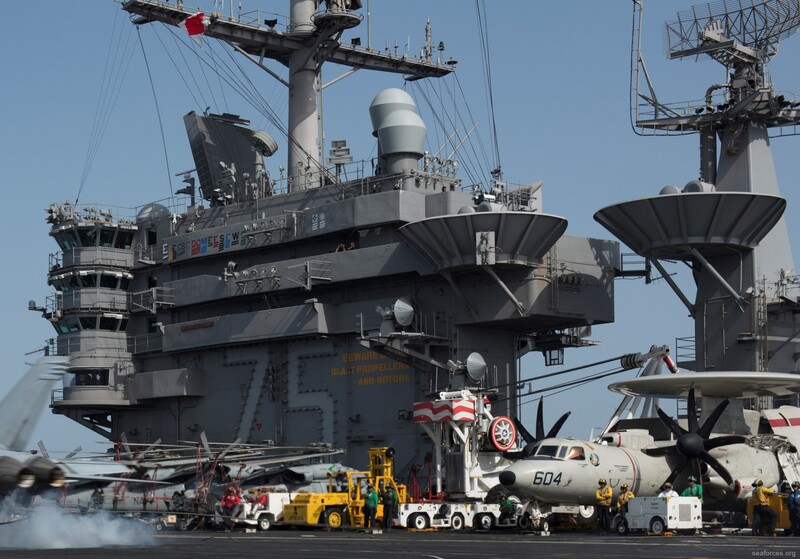 Two Grumman E-2C Hawkeyes of Carrier Airborne Early Warning Squadron (VAW) 126 deployed from Harry S. Truman in the Arabian Gulf to Kandahar AB Afghanistan, providing airborne command and control during President Hamid Karzai’s inauguration (4-13 December 2004). 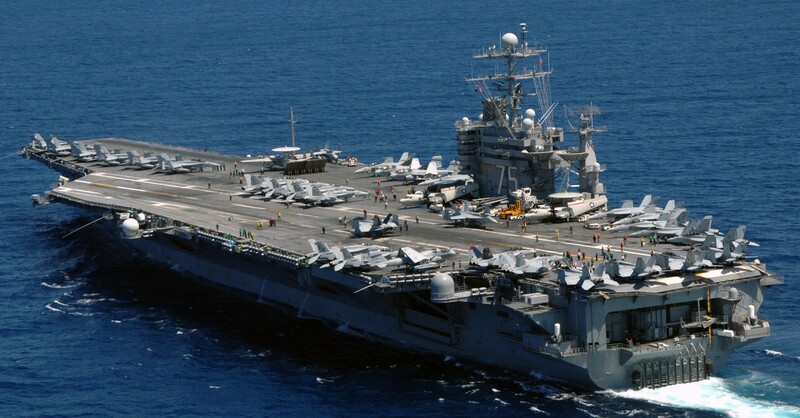 On 30 January 2005, aircraft flying from Harry S. Truman provided on-call close air support in 32 sorties during the Iraqi national elections. 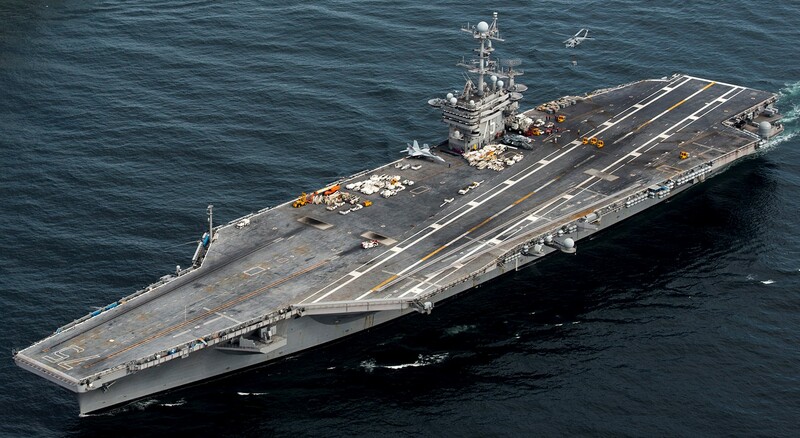 Aircraft carrier Carl Vinson (CVN-70) relieved Harry S. Truman in the Arabian Gulf on 20 March. 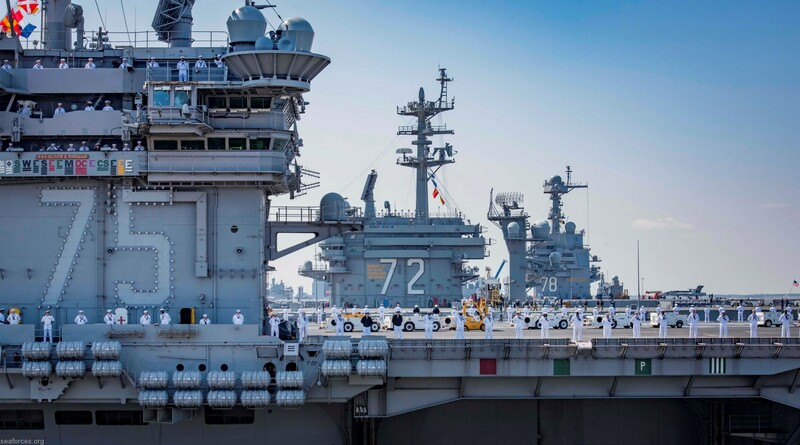 A detachment comprising half the SH-60F and HH-60Hs of HS-8 subsequently deployed from Carl Vinson to Camp Arifjan, Kuwait. 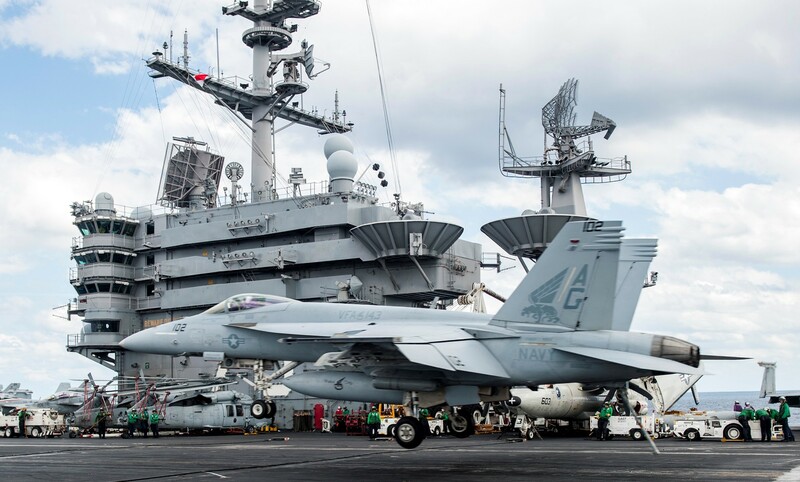 The Seahawks patrolled southeastern Iraq and flew maritime security operations over the Northern Arabian Gulf, returning to Carl Vinson on 29 June. Hurricane Katrina made landfall along the coast of the Gulf of Mexico on 29 August 2005. A catastrophic storm surge inundated the levees along the Mississippi River and the rising waters flooded 80% of New Orleans, La. 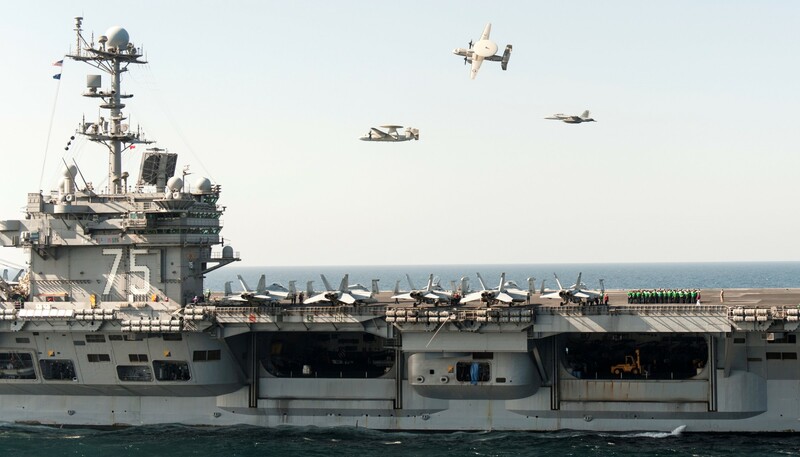 Six E-2C Hawkeyes from VAWs 77, 121, and 126 monitored airspace and directed rescue aircraft. 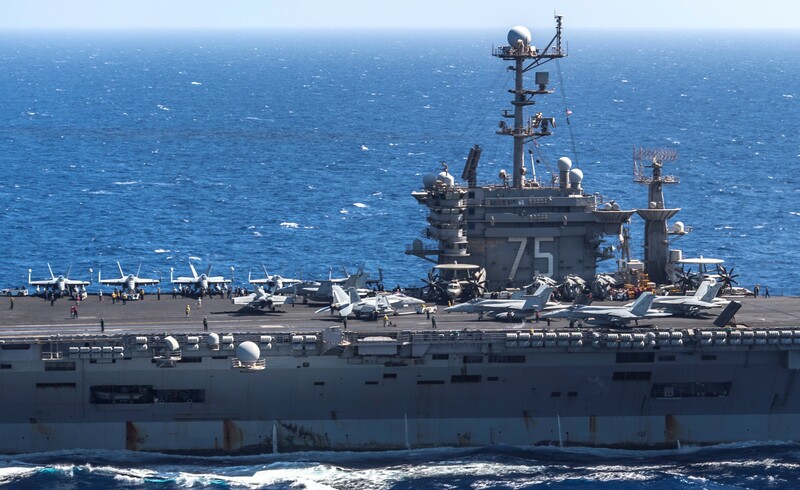 On 30 August amphibious assault ship Bataan (LHD-5) arrived, and augmented two embarked MH-60S Seahawks of Helicopter Sea Combat Squadron (HSC) 28 with four Sikorsky MH-53E Sea Stallions from Helicopter Mine Countermeasures Squadron (HM) 15. 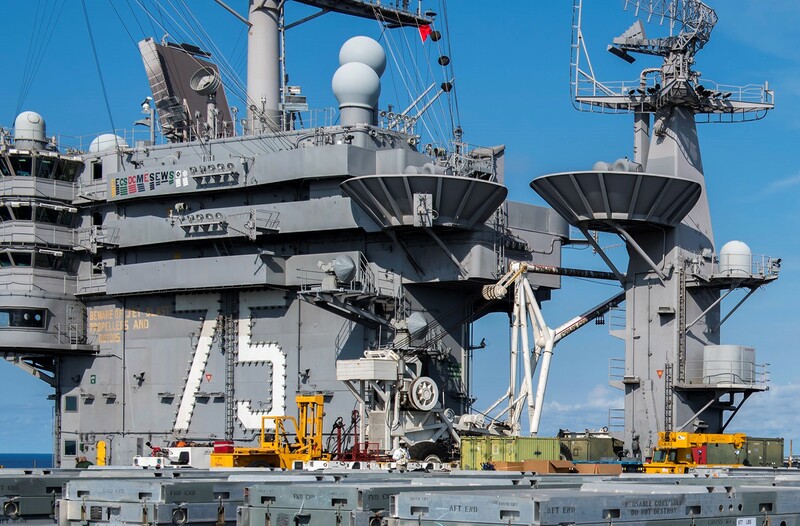 Meanwhile, amphibious assault ship Iwo Jima (LHD-7) moored at New Orleans and became a hub for helicopter operations as Headquarters, Joint Task Force Katrina. 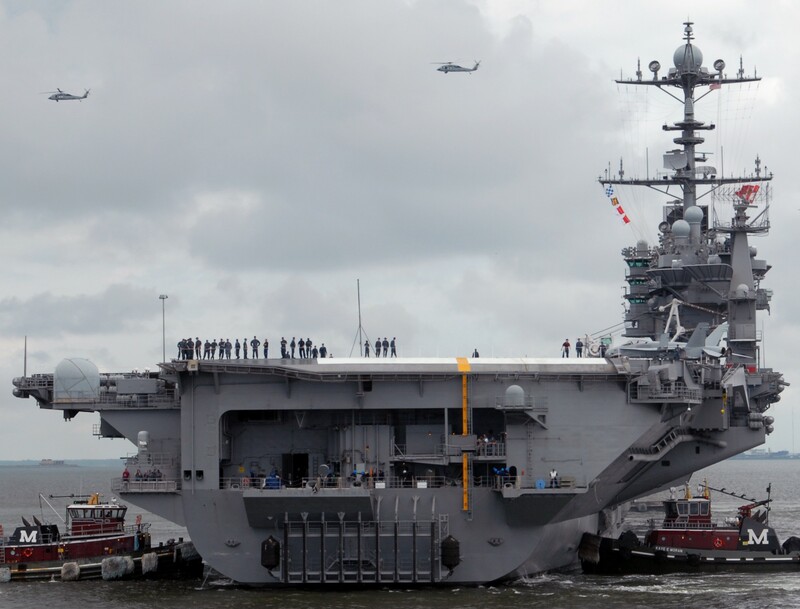 On 1 September, Harry S. Truman arrived with elements of 13 helicopter squadrons embarked. 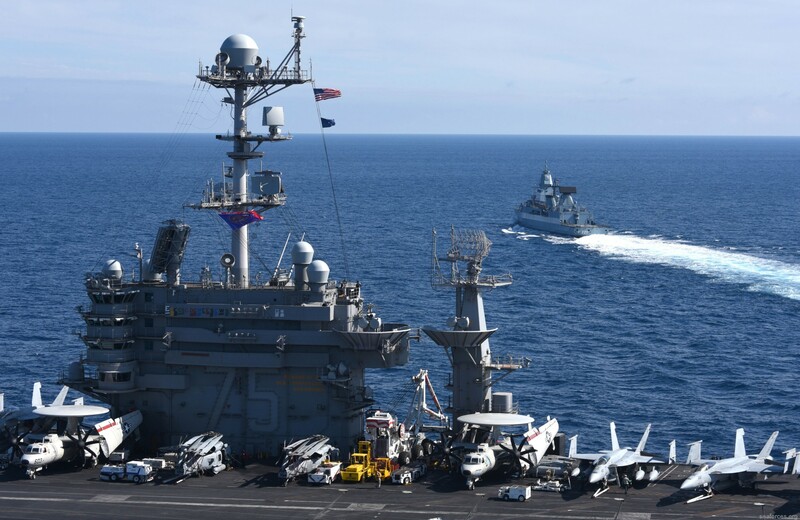 Additional naval aviation reinforcements included MH-60s of Helicopter Antisubmarine Squadrons (Light) (HSLs) 43, 47, and 49, and Helicopter Combat Support Squadron (HC) 11, two Boeing Vertol CH-46E Sea Knights and six CH-53E Super Stallions from six Marine squadrons from Marine Corps Air Station (MCAS) New River, N.C., four Super Stallions from Marine Heavy Helicopter Squadron (HMH) 772, and Fleet Logistics Support Squadrons (VRs) 57 and 58. Seventy-six Coast Guard and Coast Guard Auxiliary aircraft rescued 12,535 people during 1,817 sorties. Altogether, more than 5,000 Coast Guardsmen saved 33,545 lives. Over 70 fixed wing aircraft and more than 350 helos from all the services responded. 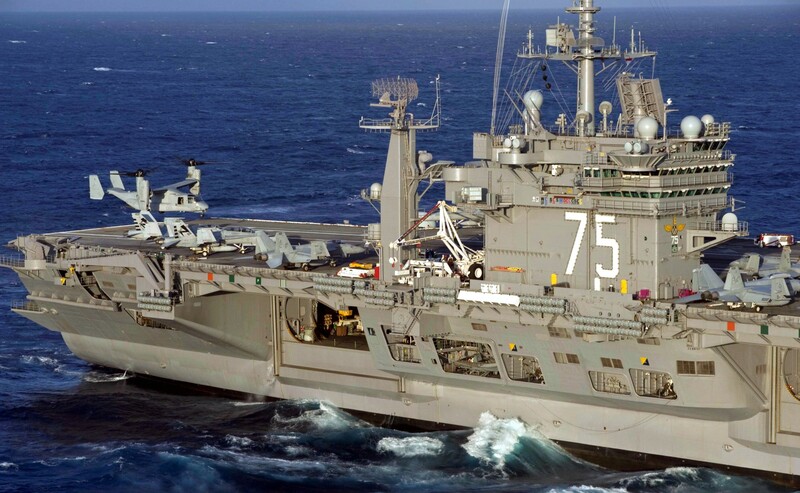 On 22 February 2008, HS-7, embarked on board Harry S. Truman, and auxiliary dry cargo ship Sacagawea (T-AKE-2) rescued ten Iraqis from Korean-flagged tanker Nadi when she sank in the Arabian Gulf. The following day HS-7 transferred the rescued mariners to British dock landing ship Cardigan Bay (L.3009) for their return to the Iraqi Navy. 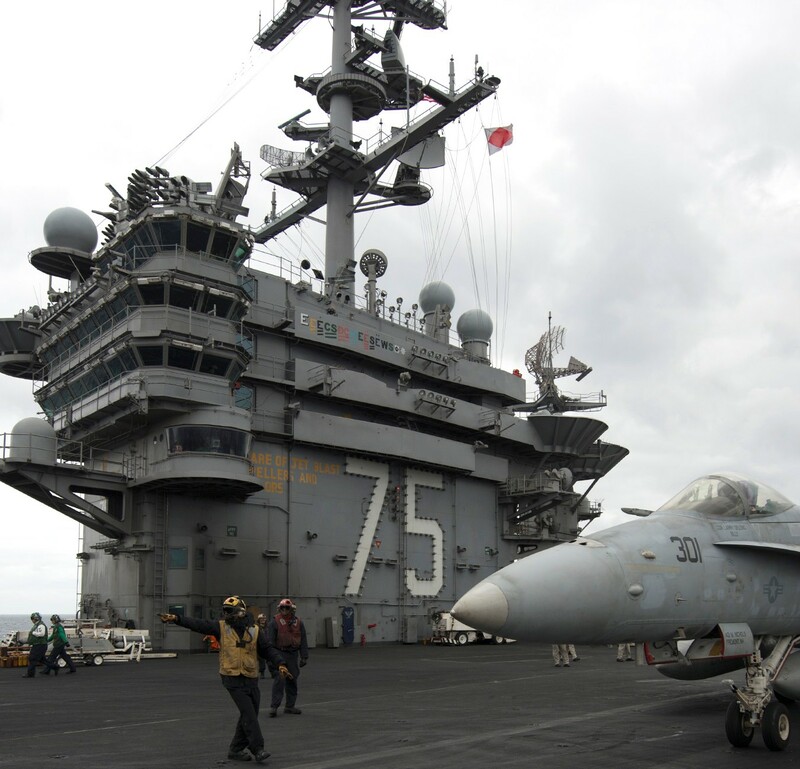 EA-18Gs from VAQs 129 and 132 completed the first Growler traps on board Harry S. Truman on 5 August 2009. Heavy rains (late July-early August 2010) caused flooding in Pakistan that killed an estimated 1,600 people and rendered hundreds of thousands homeless. 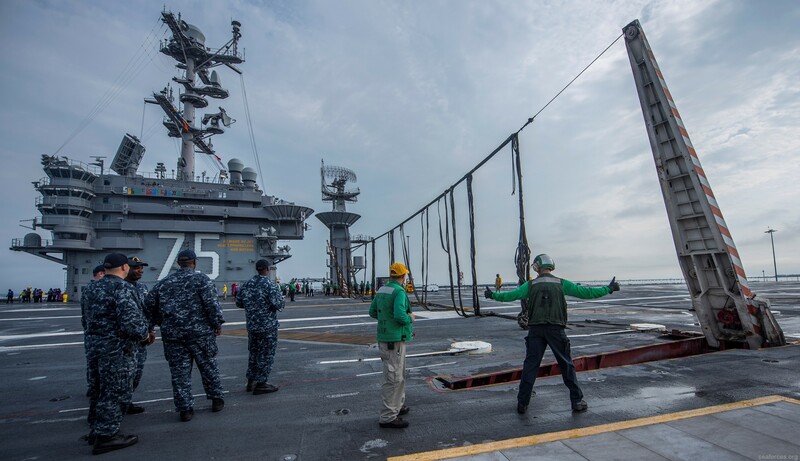 On 9 August amphibious assault ship Peleliu (LHA-5), dock landing ship Pearl Harbor (LSD-52), and amphibious transport dock Dubuque (LPD-8) arrived off Karachi, Pakistan, to render assistance. 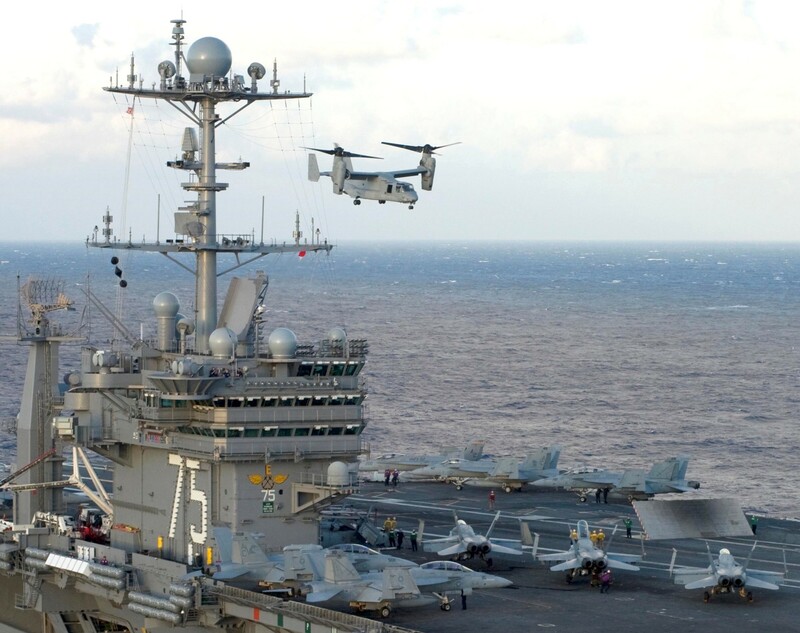 At times 15 CH-46E Sea Knights of Marine Medium Helicopter Squadron (HMM) 165 and CH-53E Super Stallions of HMH-465 from the 15th Marine Expeditionary Unit (MEU), augmented by MH-60S Seahawks of HSC-23 and three MH-53E Sea Dragons of HM-15 Detachment 2, contributed to the evacuation of 10,051 people and delivery of 1,895,038-pounds of humanitarian relief supplies to victims. Some of these helos operated from Pakistani airfields at Chaklala, Ghazi, and Pano Aqil. 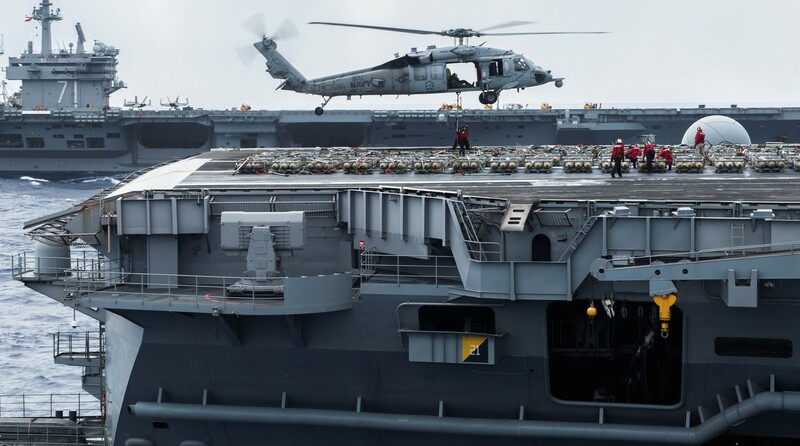 In addition, two Aérospatiale SA-330J Pumas flew from auxiliary dry cargo ship Lewis and Clark (T-AKE-1). Meanwhile, McDonnell Douglas AV-8B Harrier IIs of Marine Attack Squadron (VMA) 311 carried out close air support missions from Peleliu for coalition troops fighting Islamic extremists in Afghanistan. 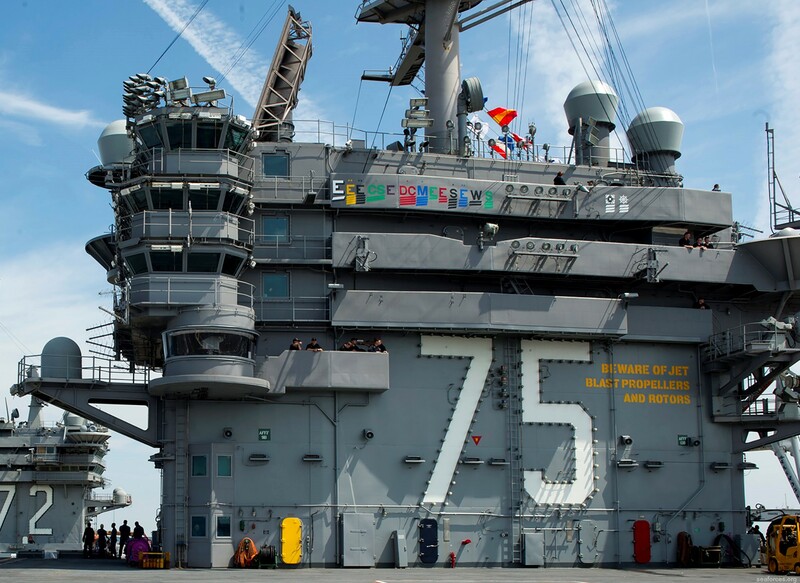 On 16 September amphibious assault ship Kearsarge (LHD-3), dock landing ship Carter Hall (LSD-50), and amphibious transport dock Ponce (LPD-15), with Bell Boeing MV-22B Ospreys of Marine Medium Tiltrotor Squadron (VMM) 266 and helos from the 26th MEU embarked, arrived to participate. Air Force cargo aircraft and ten Army Boeing CH-47 Chinooks and eight Sikorsky UH-60 Black Hawks also flew humanitarian assistance missions. Peleliu came about on 31 October. 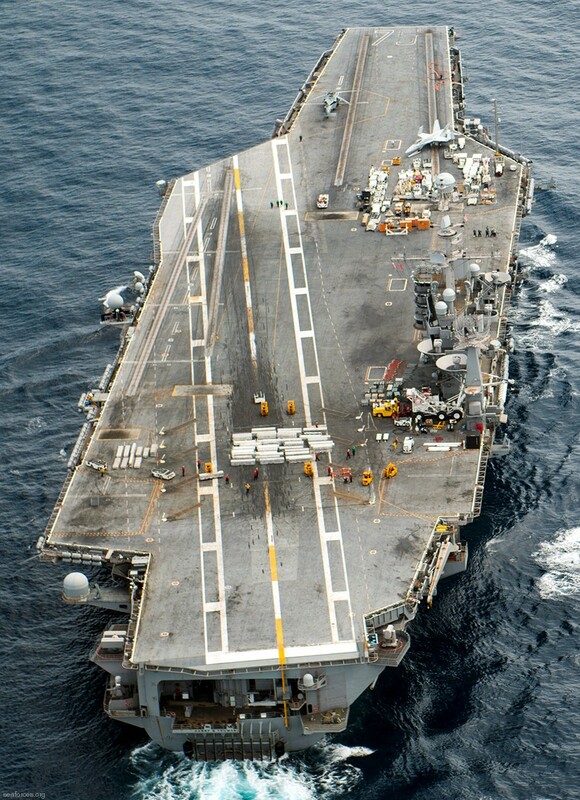 Harry S. Truman subsequently arrived, and on 15 November four Super Stallions of the 26th MEU’s VMM-266 refueled on board. 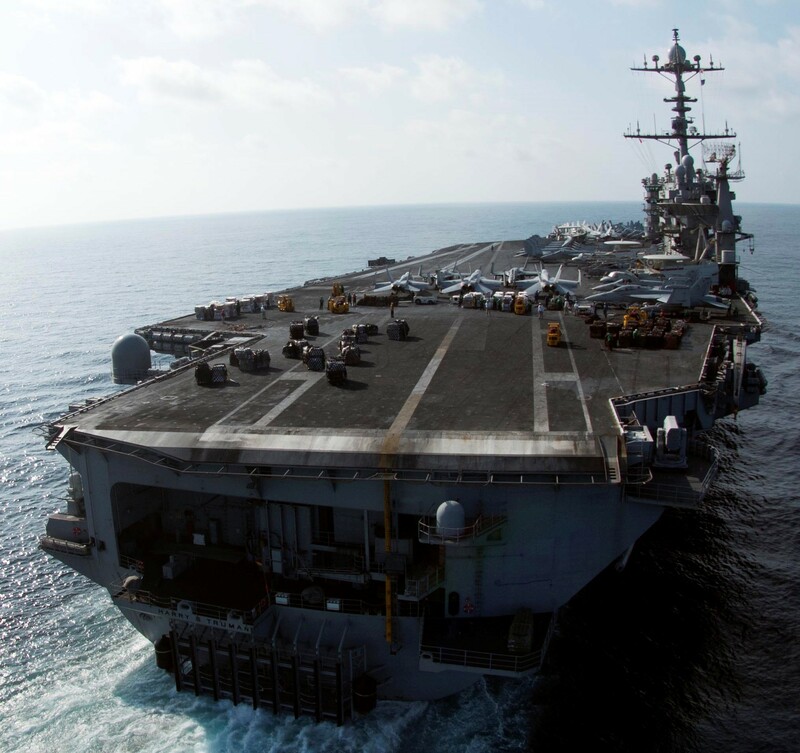 Truman began a seven-month deployment to the 5th and 6th Fleet areas of operations in support of maritime security operations on 21 May 2010. 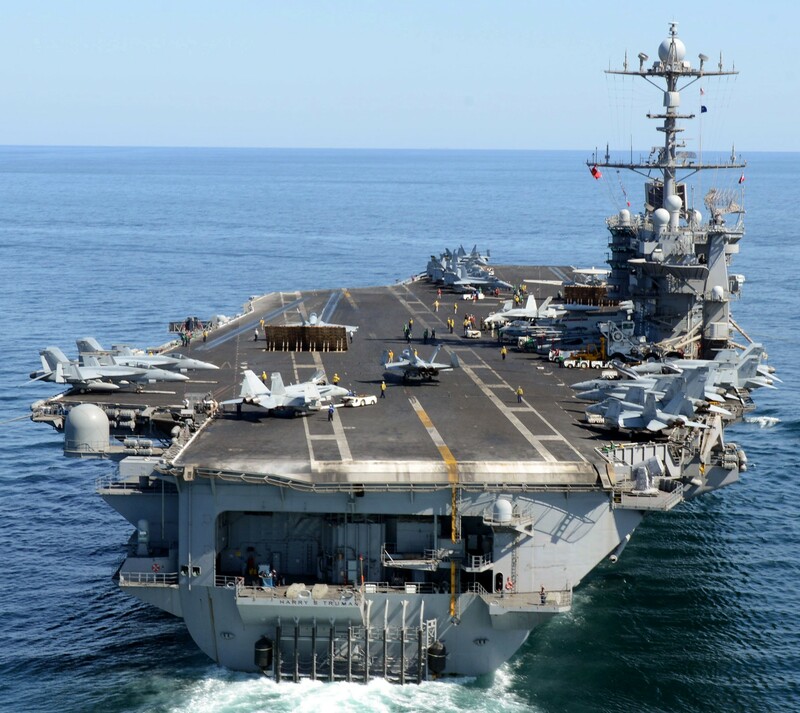 Truman led a task force of 11 American warships and 5,000 men into the Suez Canal on 20 June 2010. 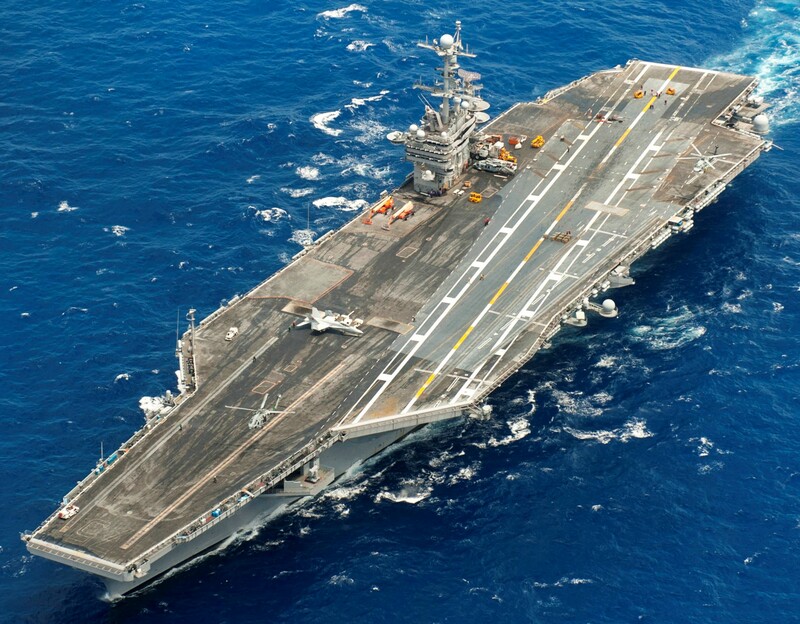 An F/A-18C Hornet of VFA-37, embarked on board Harry S. Truman in the Northern Arabian Sea, spotted a vessel on fire about 50 miles from the carrier on 18 August 2010. 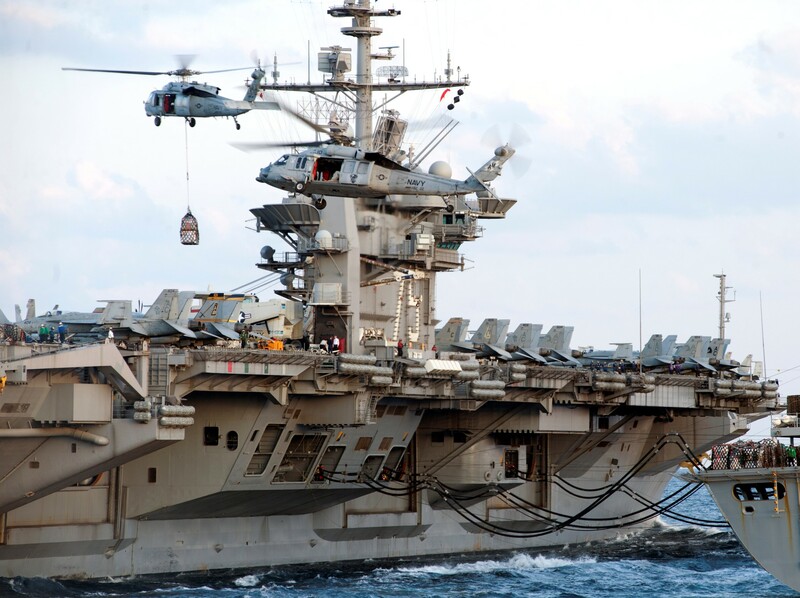 Two SH-60F Seahawks of HS-7 rescued all eight Iranian seafarers from their stricken vessel. 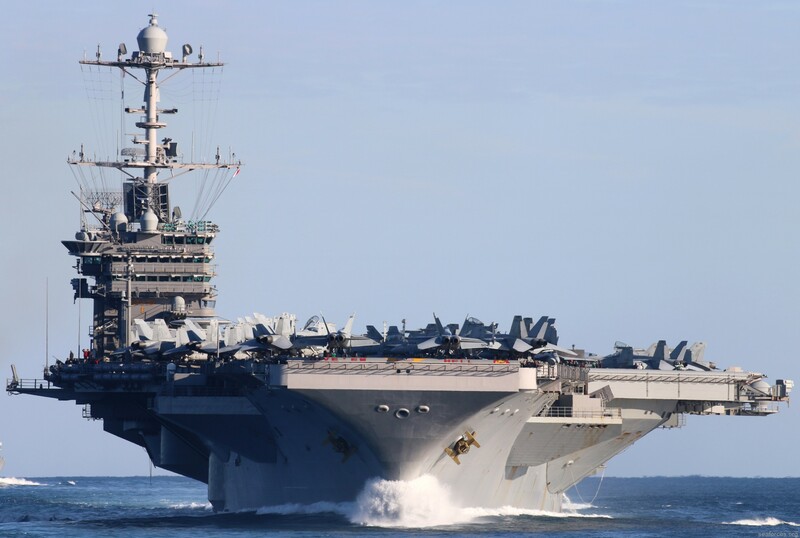 The ship visited four ports during its 213 days at sea, including Marseille, France; Dubai, U.A.E; Manama, Bahrain; and Souda Bay, Crete, before returning to the United States on 20 December 2010. 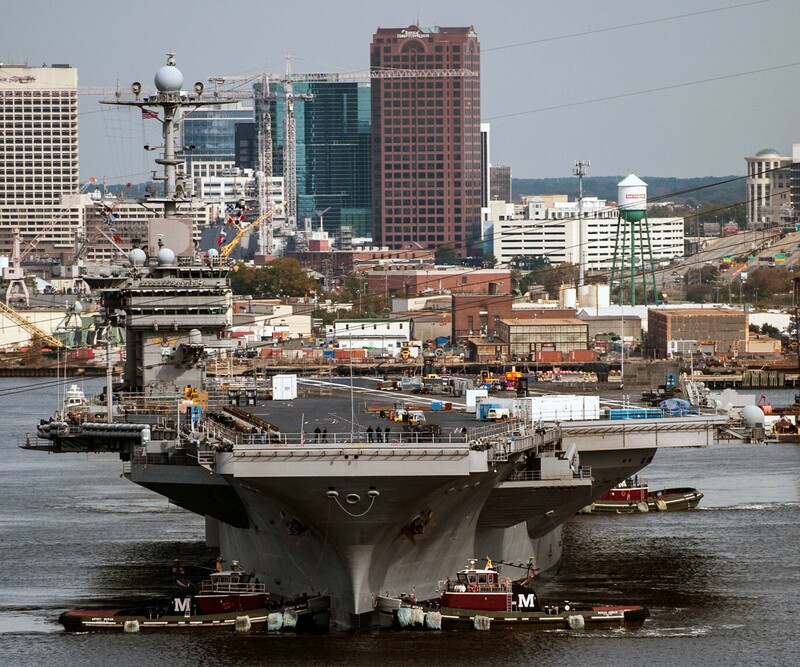 On 7 April 2012, Norfolk Naval Shipyard completed the ship's nuclear power plant modernization and testing was to begin to ensure its readiness for sea trials lasting 90 days. 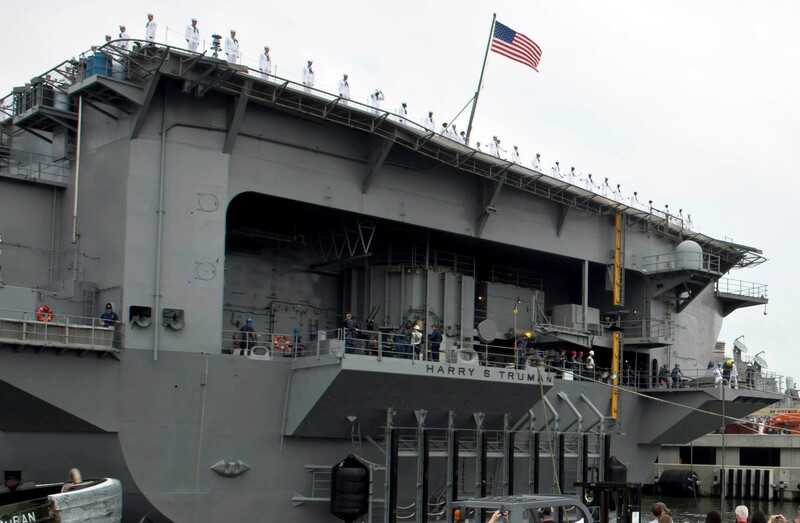 Harry S. Truman returned to the U.S. Navy fleet in the summer of 2012. 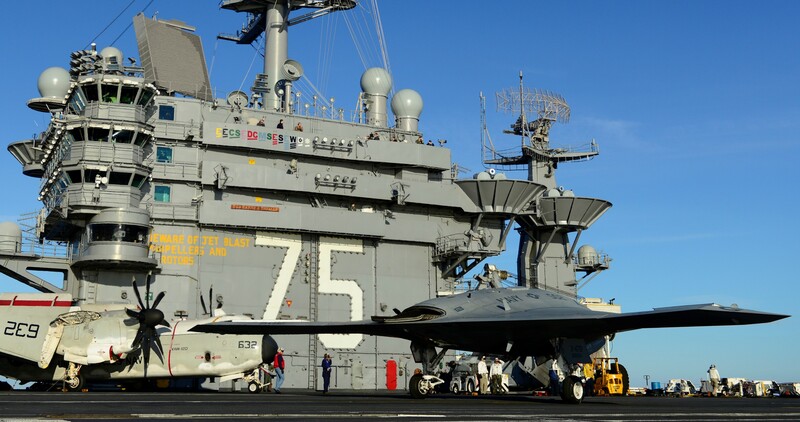 On 26 November 2012, an X-47B Unmanned Combat Air System (UCAS) was hoisted on board the Truman in preparation for an unmanned aircraft's first, carrier-based testing. 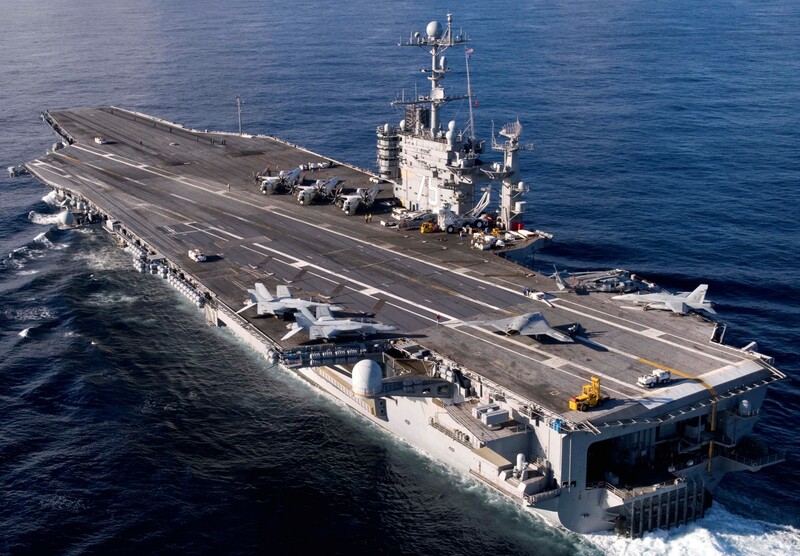 Truman was to be the first aircraft carrier in Naval aviation history to host test operations for an unmanned aircraft. 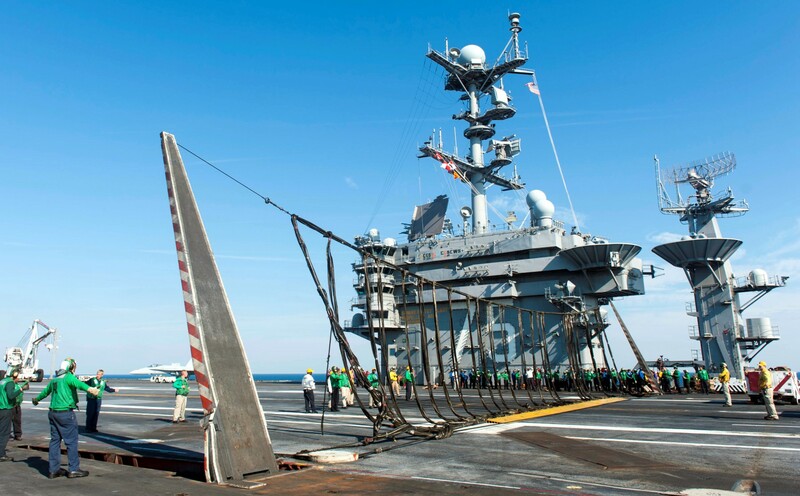 Testing on the X-47B was conducted over a three-week period that included in-port and underway demonstrations aboard. 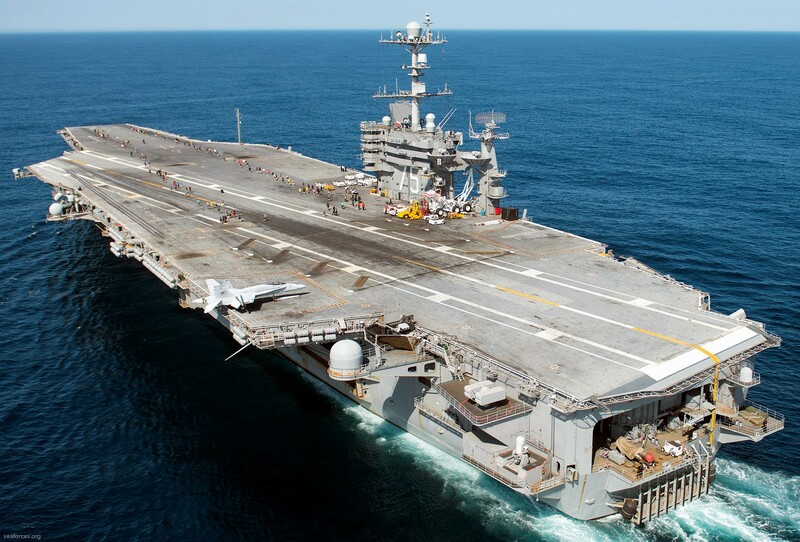 The X-47B successfully completed carrier deck tests aboard the Harry S Truman on 18 December 2012. 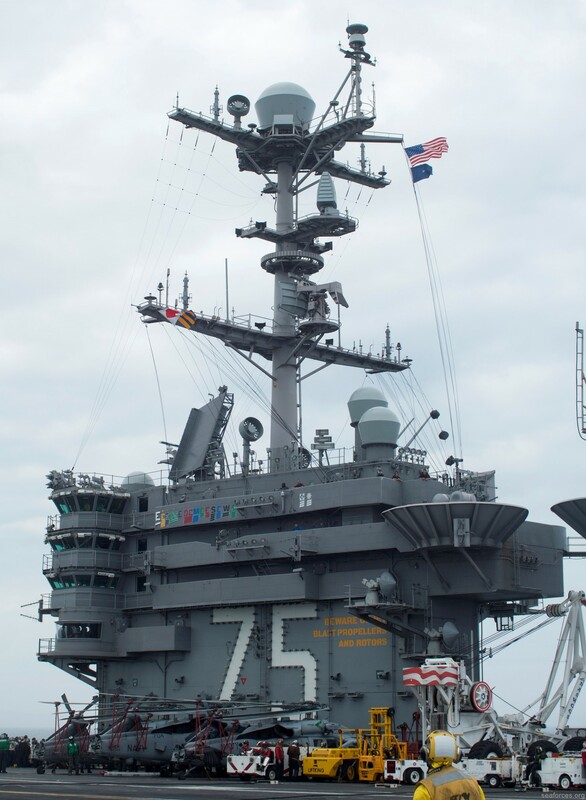 On 21 December 2015, Djibouti President Ismail Omar Guelleh visited USS Harry S. Truman stationed near the Yemeni island of Berim. 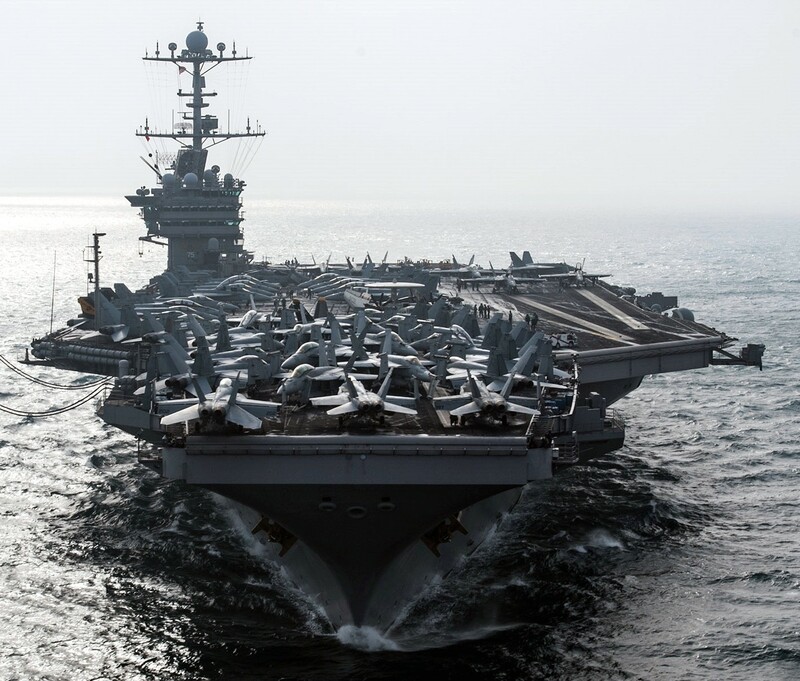 On 26 December while transiting the Straight of Hormuz several unguided rockets fired by Iran landed approximately 1,500 yards (1,400 m) away from Harry S. Truman which was traveling with the destroyer Bulkeley and the French frigate Provence. 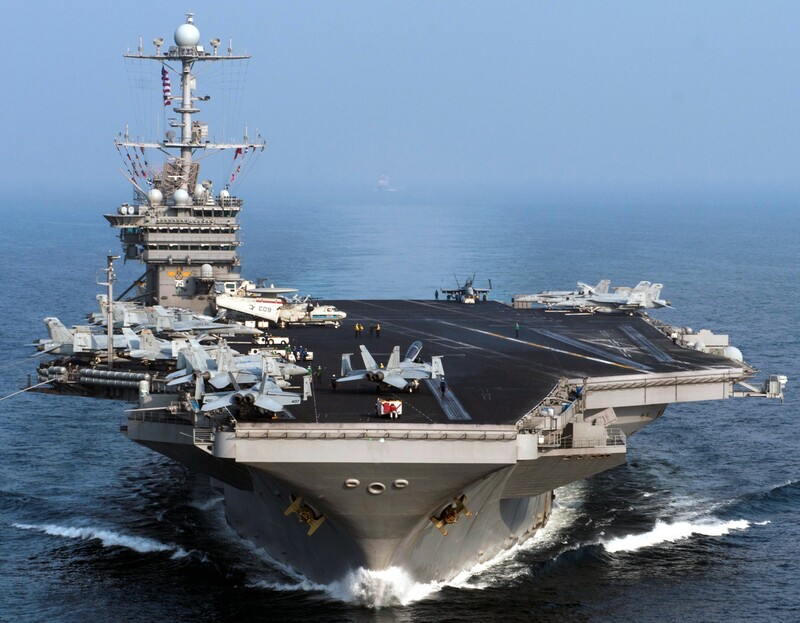 Iran had announced over maritime radio they were carrying out tests "only 23 minutes before" and were criticized by the U.S. Central Command for "Firing weapons so close to passing coalition ships and commercial traffic within an internationally recognized maritime traffic lane." 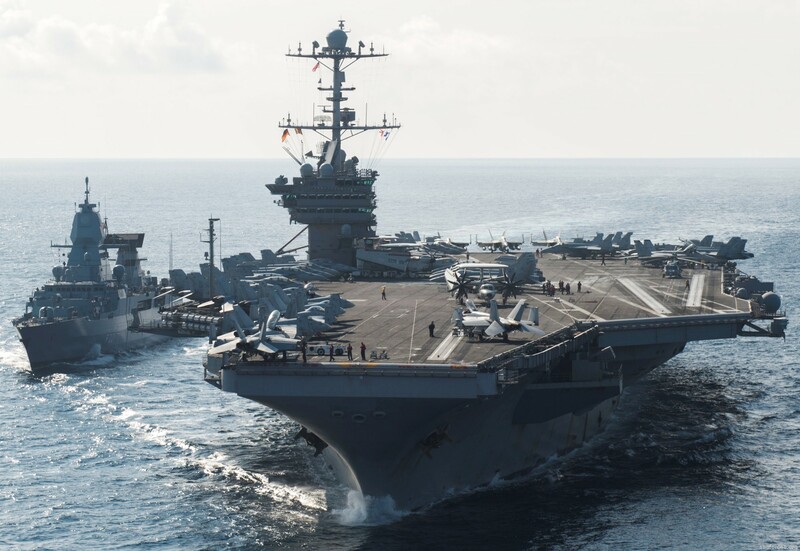 On 29 December 2015, Harry S. Truman began launching strikes against the Islamic State group. 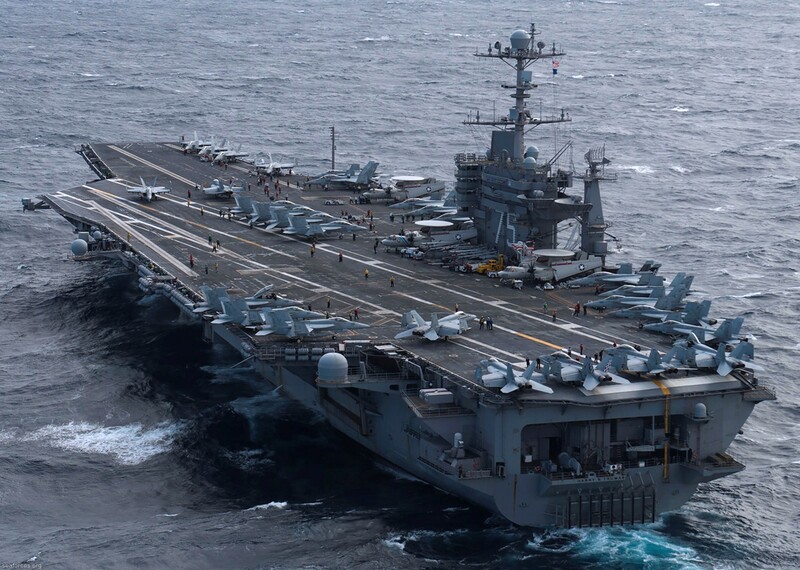 By mid-April 2016, aircraft of Carrier Air Wing Seven operating from the carrier had dropped 1,118 pieces of ordnance in operations against the group, surpassing a record of 1,085 pieces that was set by aircraft assigned to USS Theodore Roosevelt in 2015. 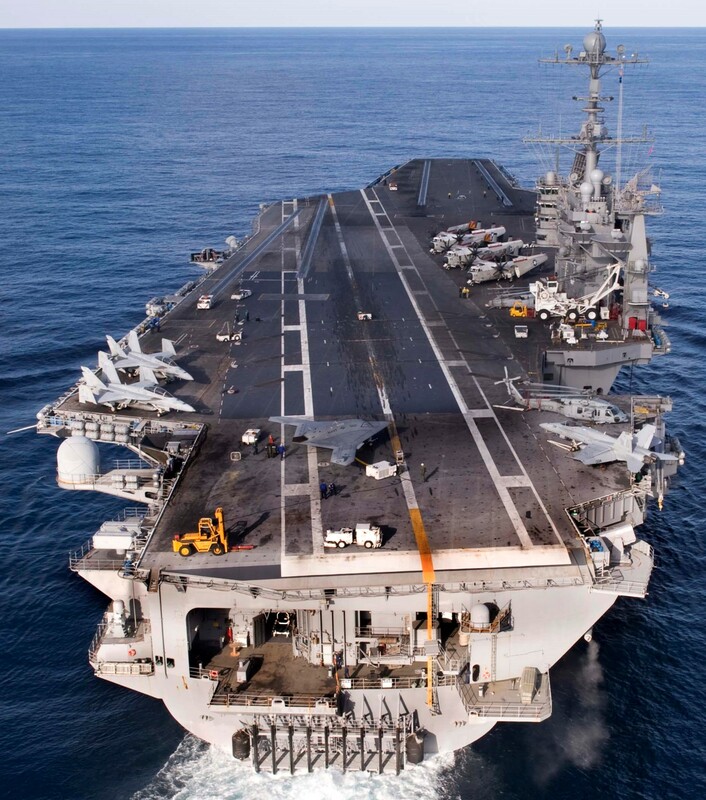 On 12 January 2016, an unarmed Iranian drone flew directly over Harry S. Truman in international waters and took "precise" photos, according to state television in the Islamic Republic. 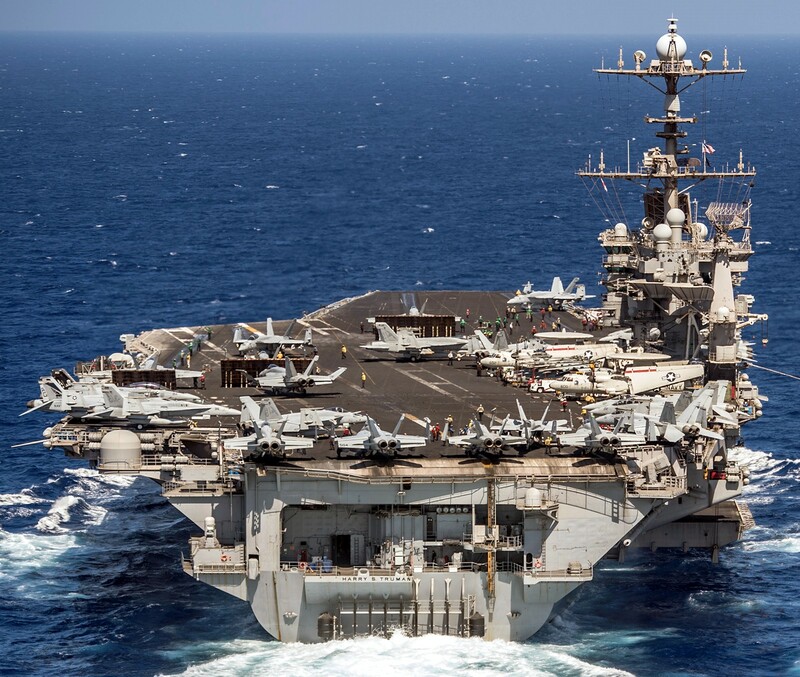 On 3 June 2016, F/A-18 Hornets launched from Harry S. Truman conducted air strikes against ISIS targets from the eastern Mediterranean. 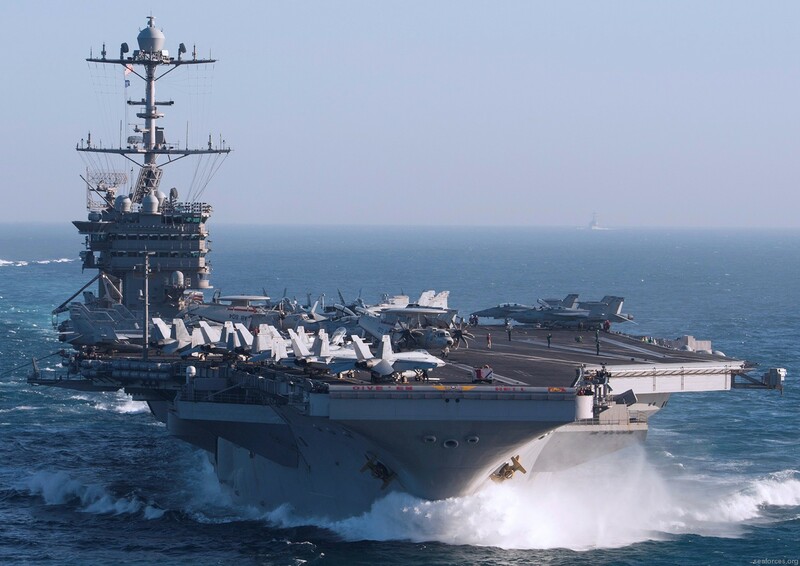 It was the first time the U.S. Navy had conducted strike missions in the Middle East from the Mediterranean Sea since flying operations against the Iraqi military in 2003. 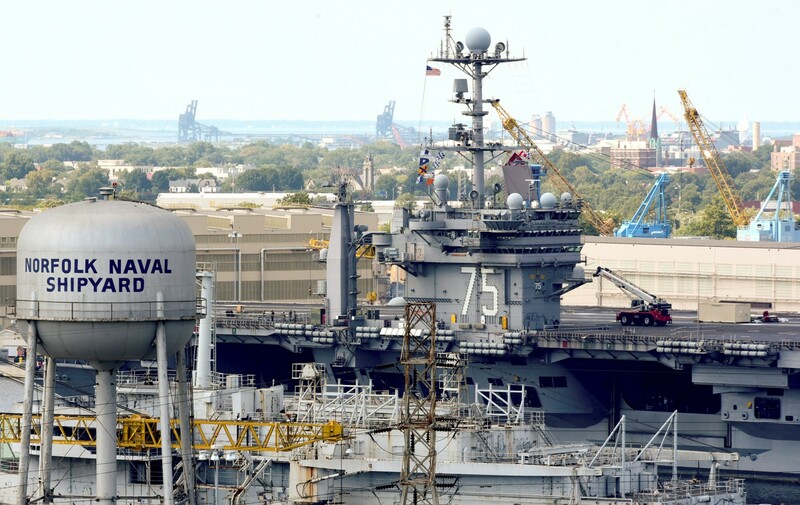 On July 21, 2017, TRUMAN completed an on-time, 10-month Planned Incremental Availability (PIA) at Norfolk Naval Shipyard for maintenance and refurbishment of shipboard systems to prepare for future operations. 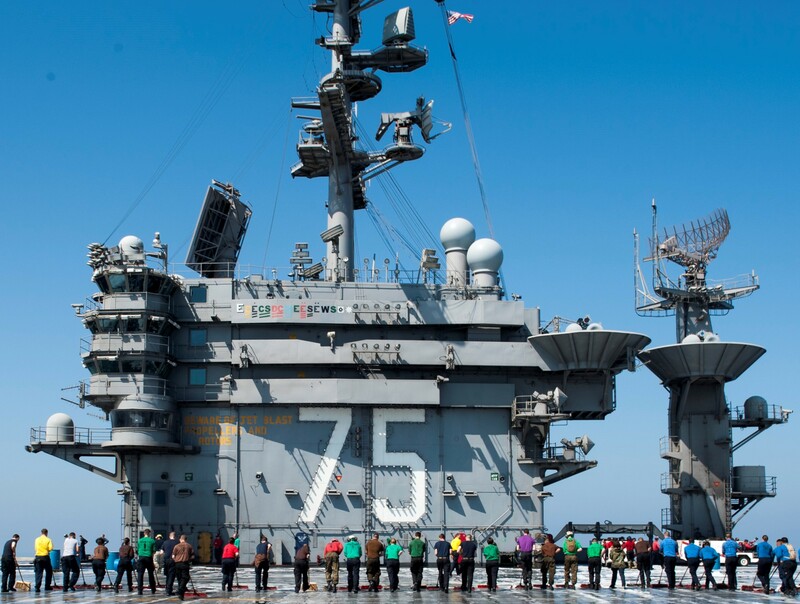 Over the next six months, TRUMAN completed a robust work-up cycle in preparation for deployment. 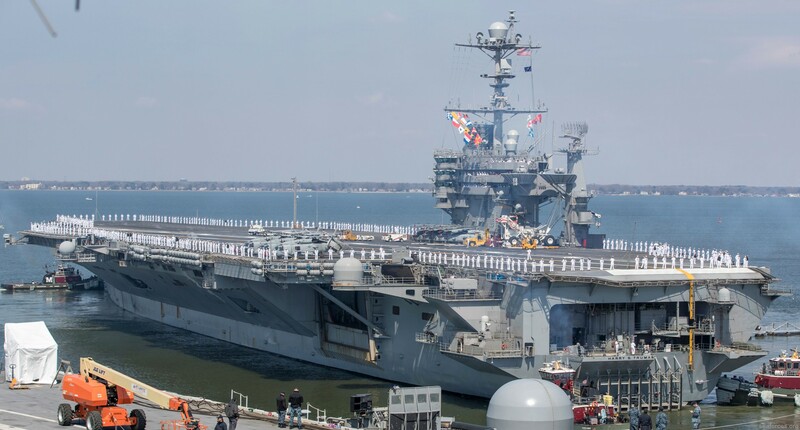 On April 11, 2018, TRUMAN departed Norfolk for a routine deployment in support of National missions and maritime security. 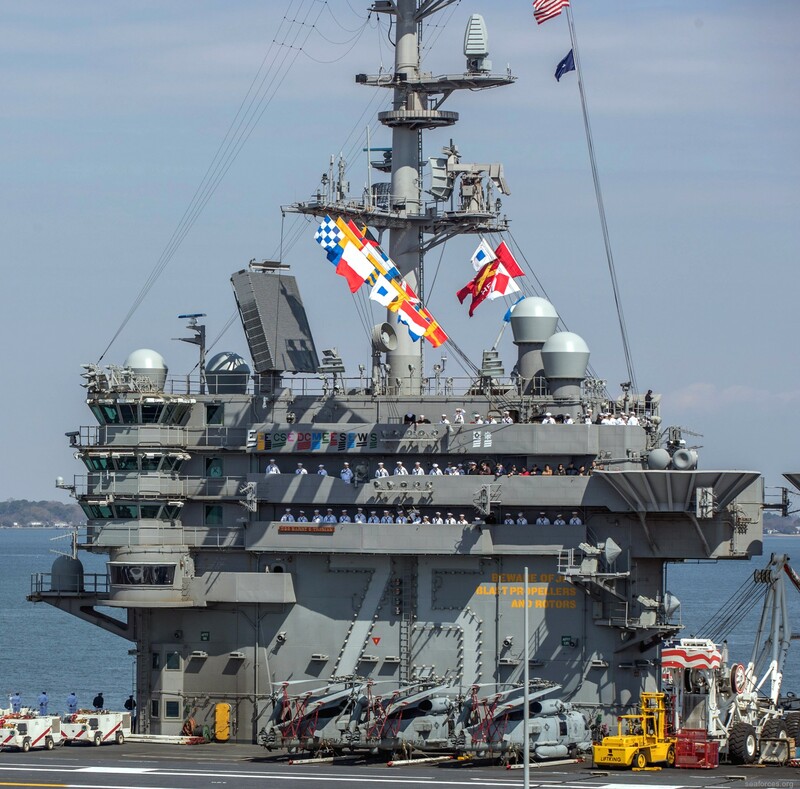 Truman is currently deployed to the U.S. 6th Fleet area of operations to conduct routine operations and demonstrate the mobility, flexibility and power projection capability of the Navy’s globally deployed force.